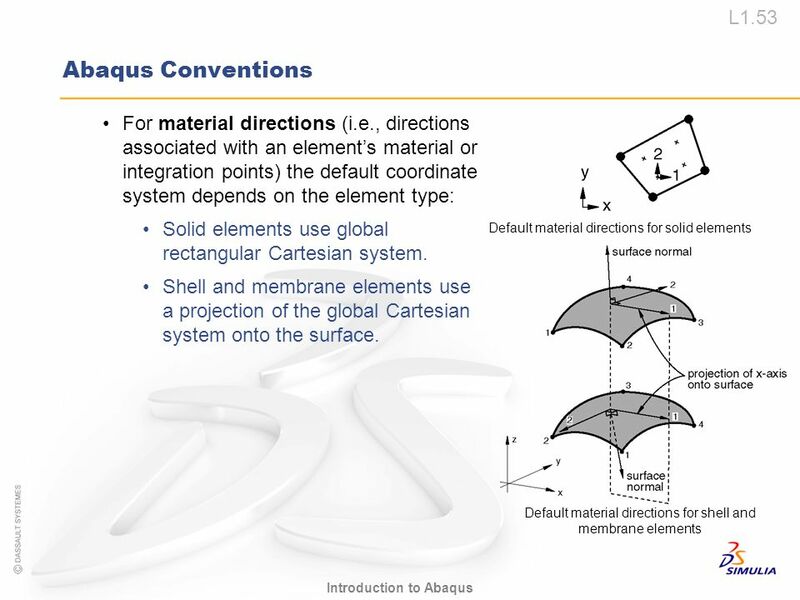 Overview of Abaqus Lecture 1. 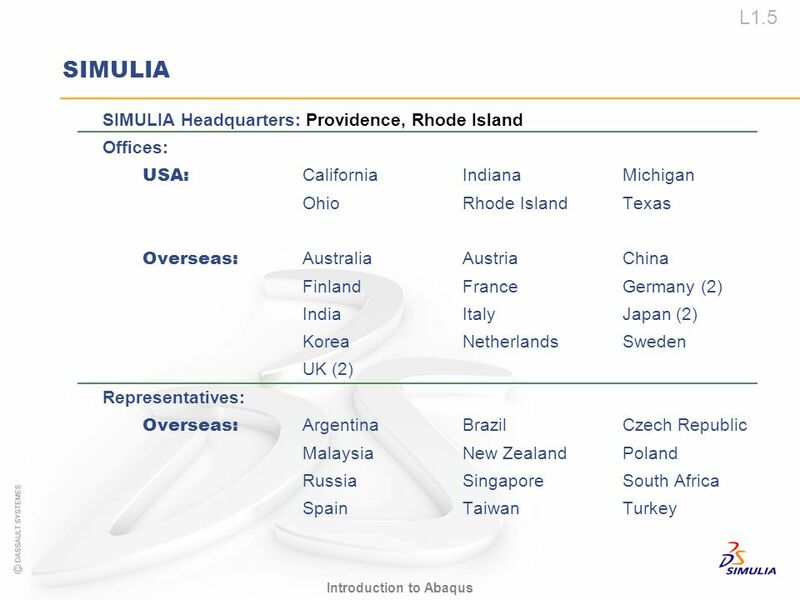 USA:	California Indiana Michigan Ohio	Rhode Island	Texas Overseas:	Australia Austria China Finland France Germany (2) India Italy Japan (2) Korea Netherlands Sweden UK (2) Representatives: Overseas:	Argentina	Brazil Czech Republic Malaysia New Zealand Poland Russia	Singapore South Africa Spain Taiwan Turkey SIMULIA is the Dassault Systèmes brand that delivers realistic simulation solutions including the Abaqus product suite. 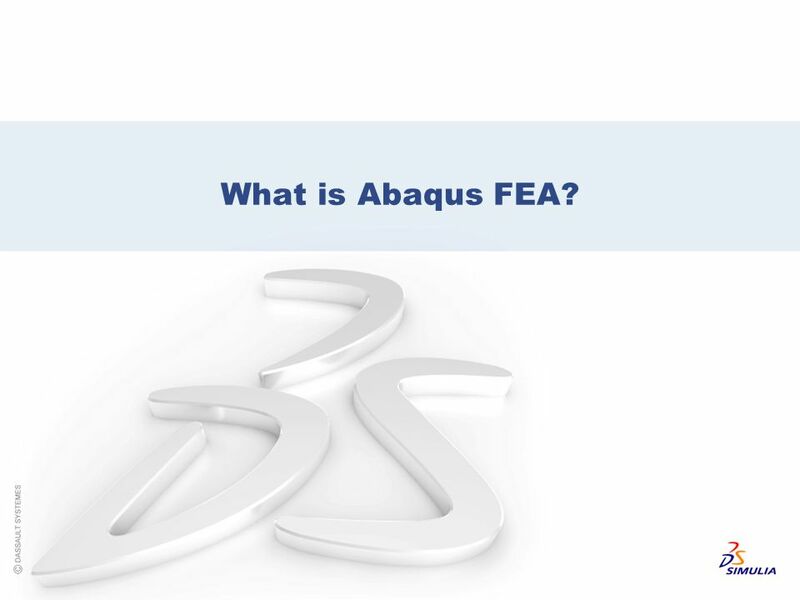 6 What is Abaqus FEA? 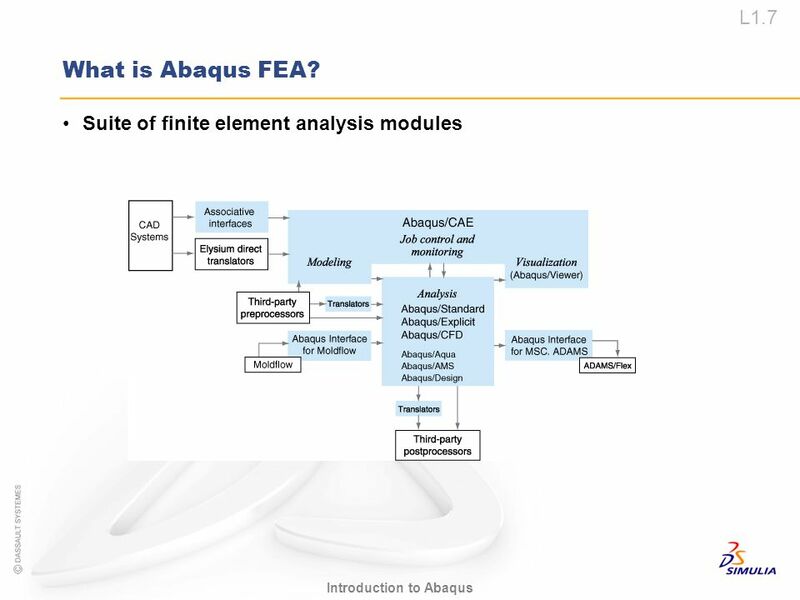 8 What is Abaqus FEA? 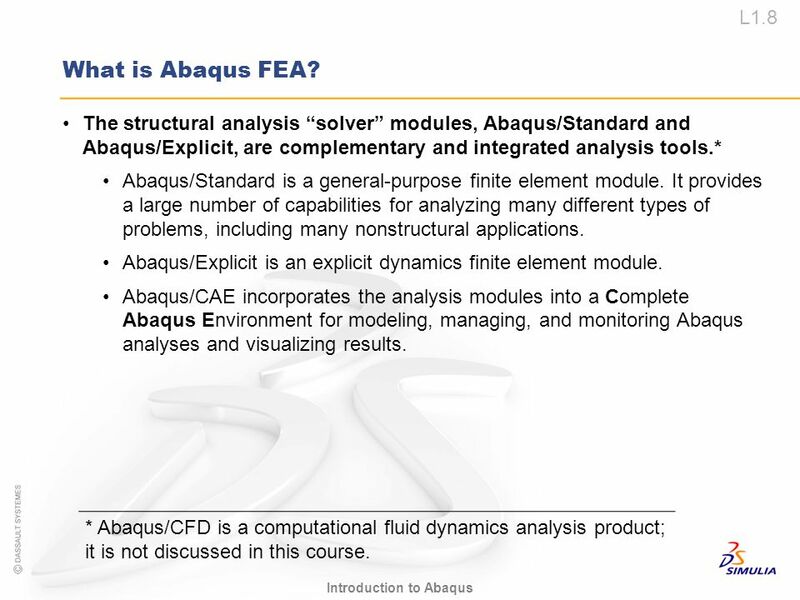 The structural analysis “solver” modules, Abaqus/Standard and Abaqus/Explicit, are complementary and integrated analysis tools. 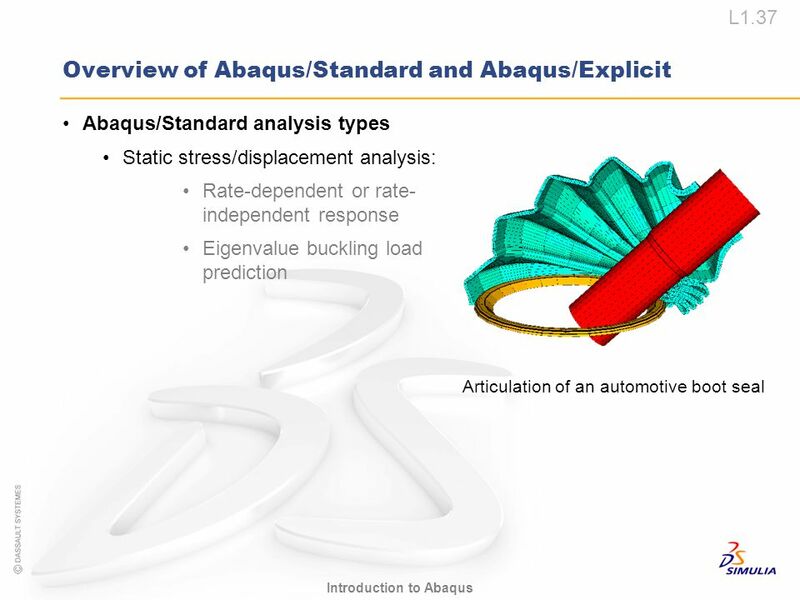 * Abaqus/Standard is a general-purpose finite element module. 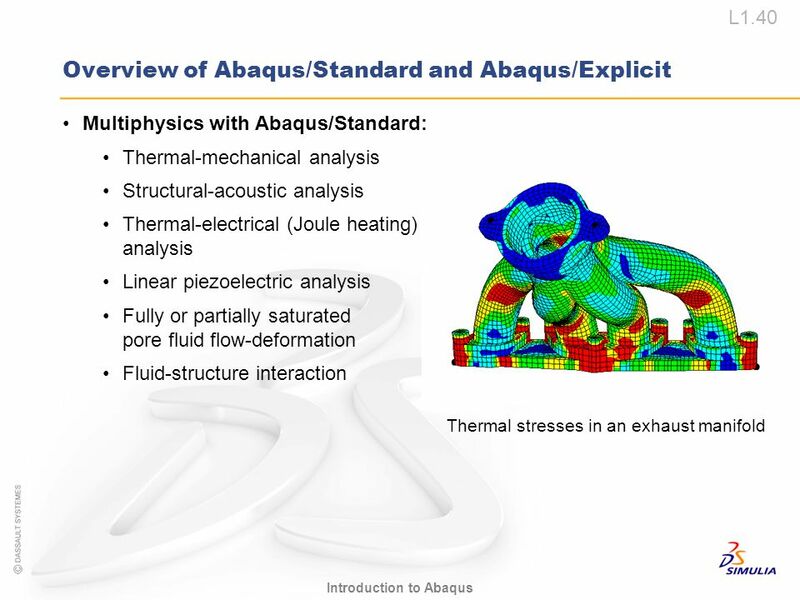 It provides a large number of capabilities for analyzing many different types of problems, including many nonstructural applications. 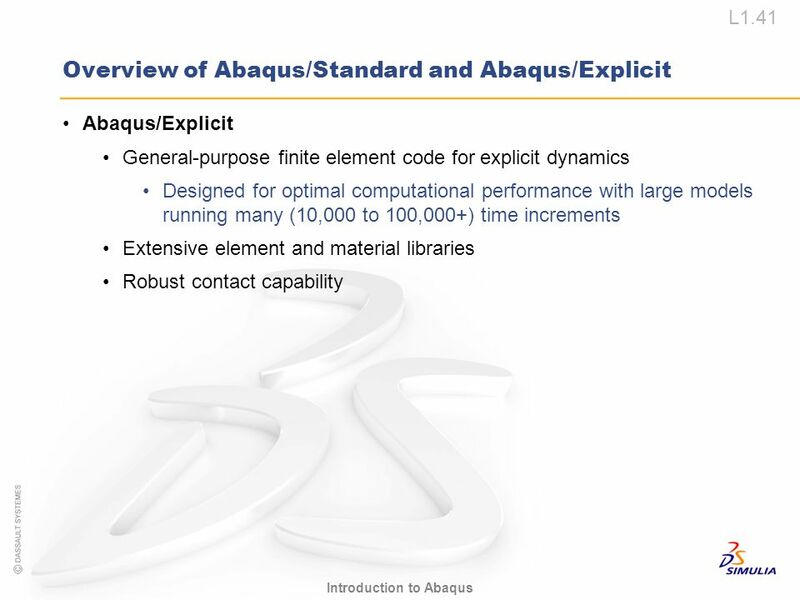 Abaqus/Explicit is an explicit dynamics finite element module. 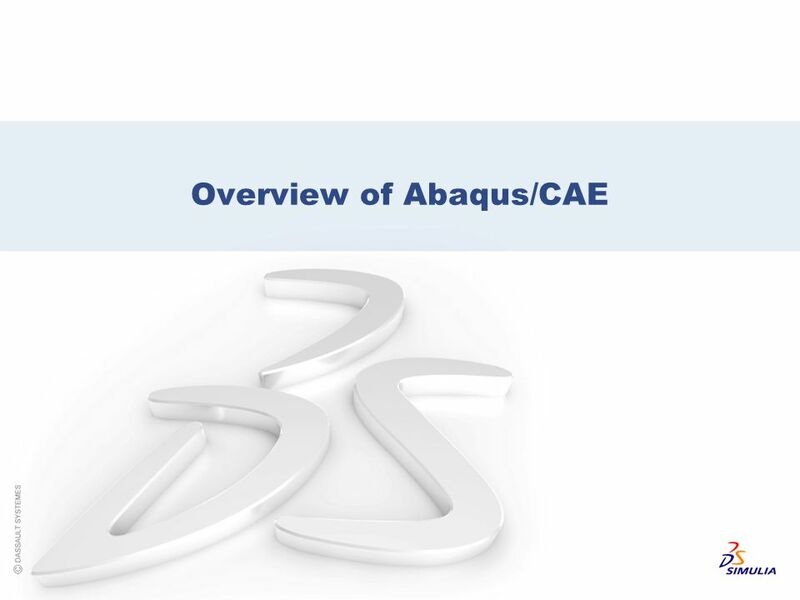 Abaqus/CAE incorporates the analysis modules into a Complete Abaqus Environment for modeling, managing, and monitoring Abaqus analyses and visualizing results. 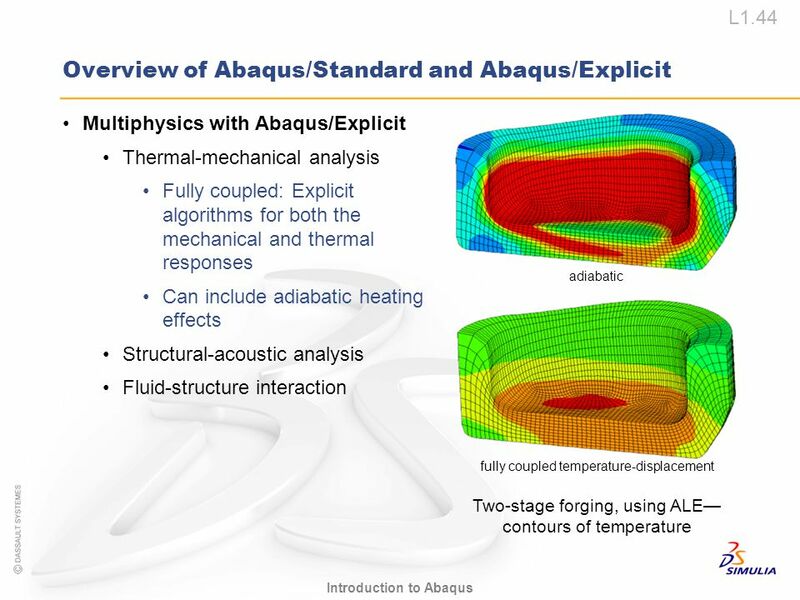 * Abaqus/CFD is a computational fluid dynamics analysis product; it is not discussed in this course. 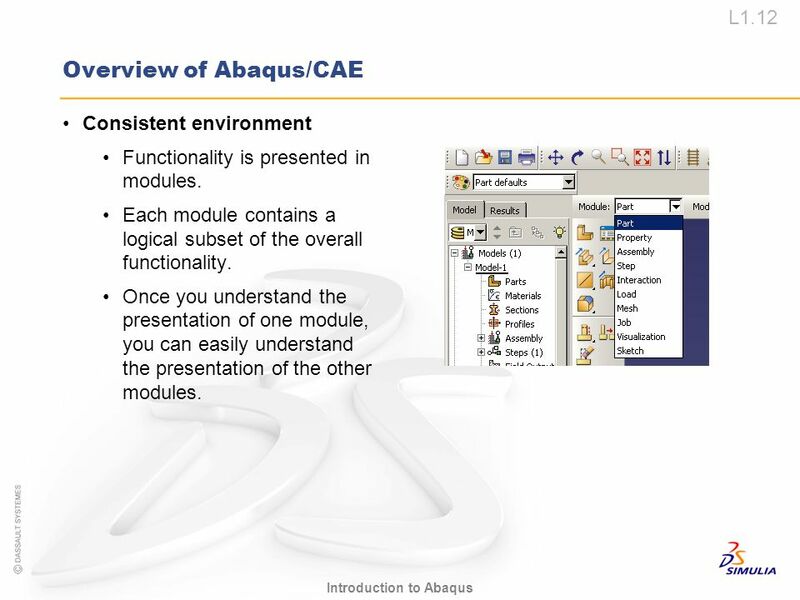 Consistent environment Functionality is presented in modules. 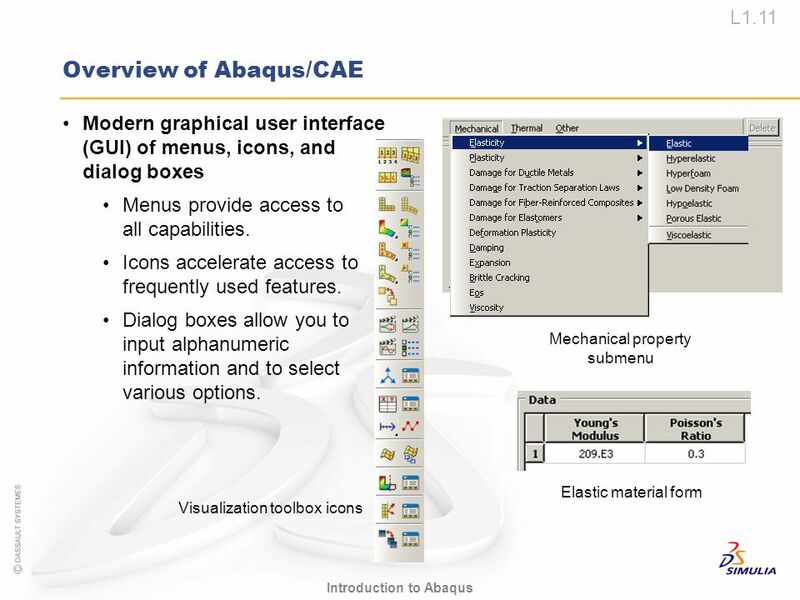 Each module contains a logical subset of the overall functionality. 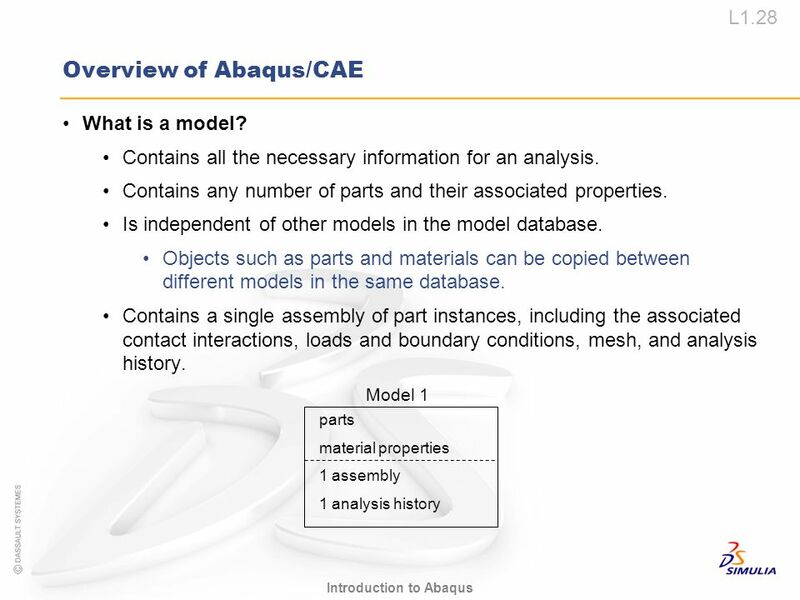 Once you understand the presentation of one module, you can easily understand the presentation of the other modules. 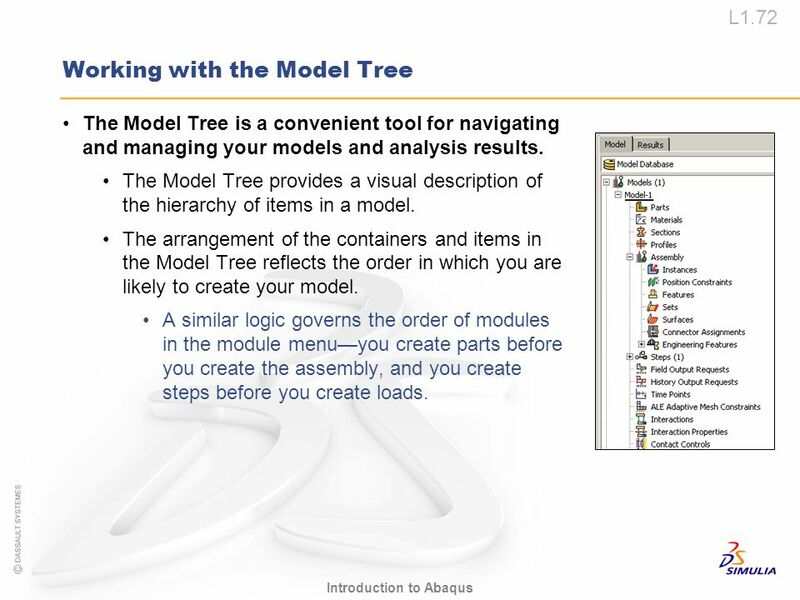 Model Tree and the Results Tree The Model Tree provides you with a graphical overview of your model and the objects that it contains. 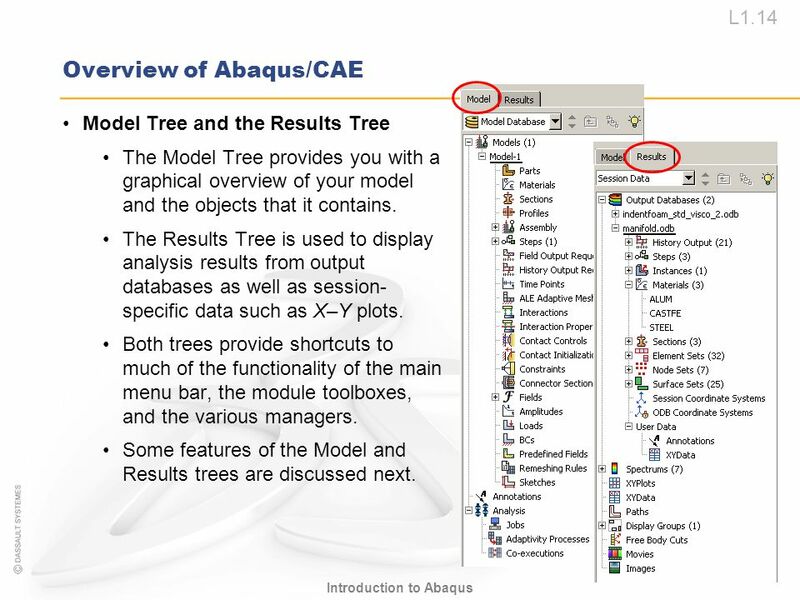 The Results Tree is used to display analysis results from output databases as well as session-specific data such as X–Y plots. 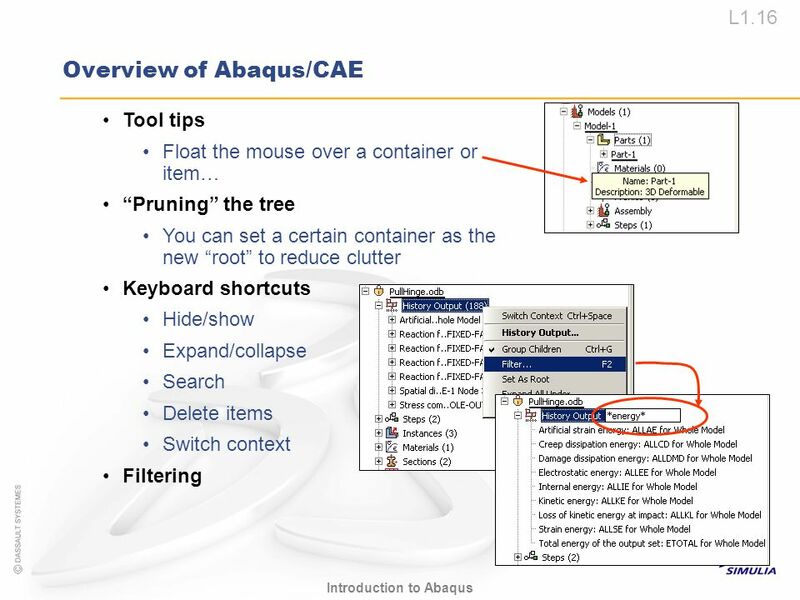 Both trees provide shortcuts to much of the functionality of the main menu bar, the module toolboxes, and the various managers. 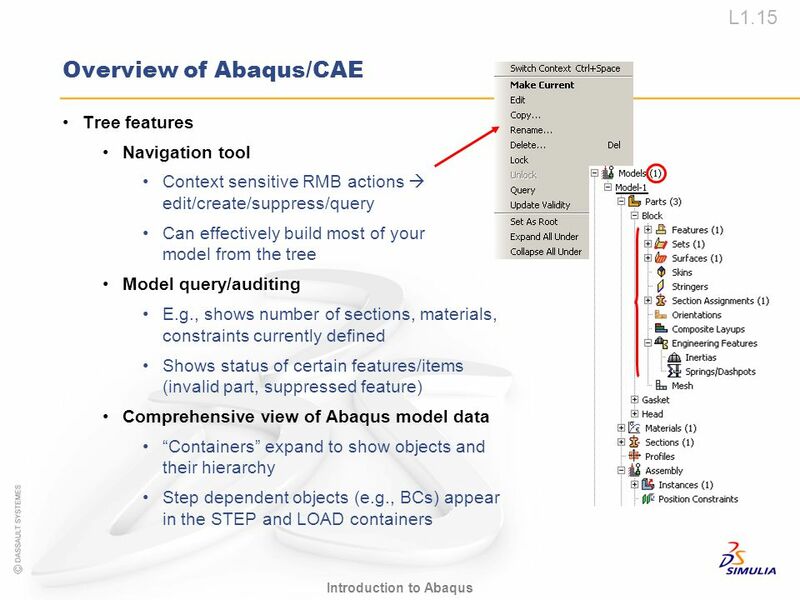 Some features of the Model and Results trees are discussed next. 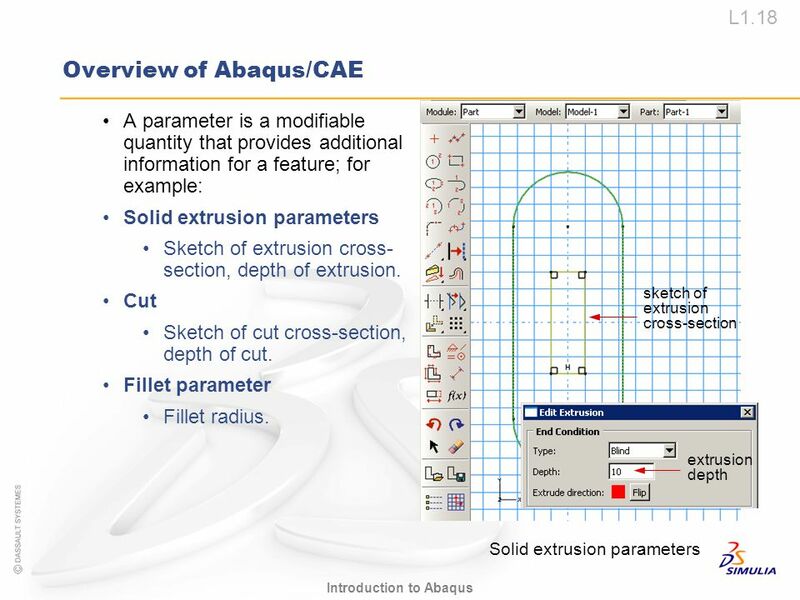 Solid extrusion parameters sketch of extrusion cross-section extrusion depth A parameter is a modifiable quantity that provides additional information for a feature; for example: Solid extrusion parameters Sketch of extrusion cross-section, depth of extrusion. Cut Sketch of cut cross-section, depth of cut. Fillet parameter Fillet radius. 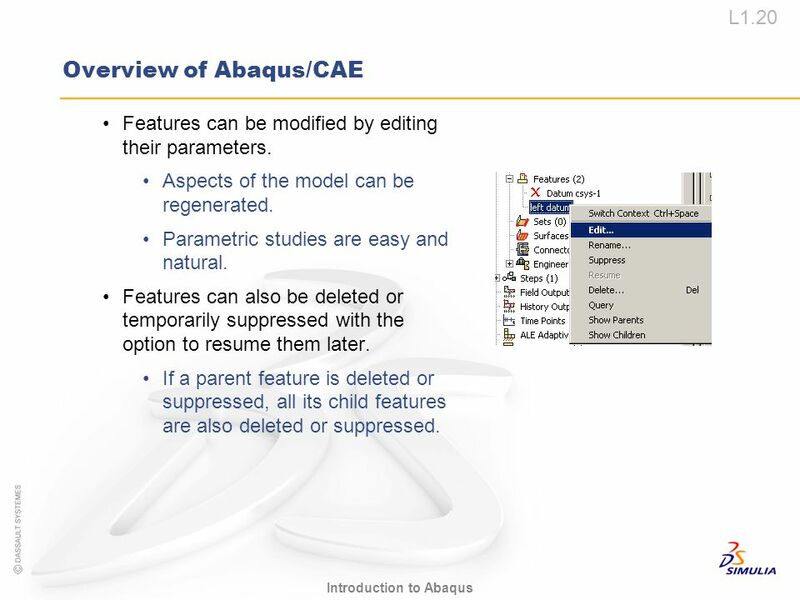 Features can be modified by editing their parameters. 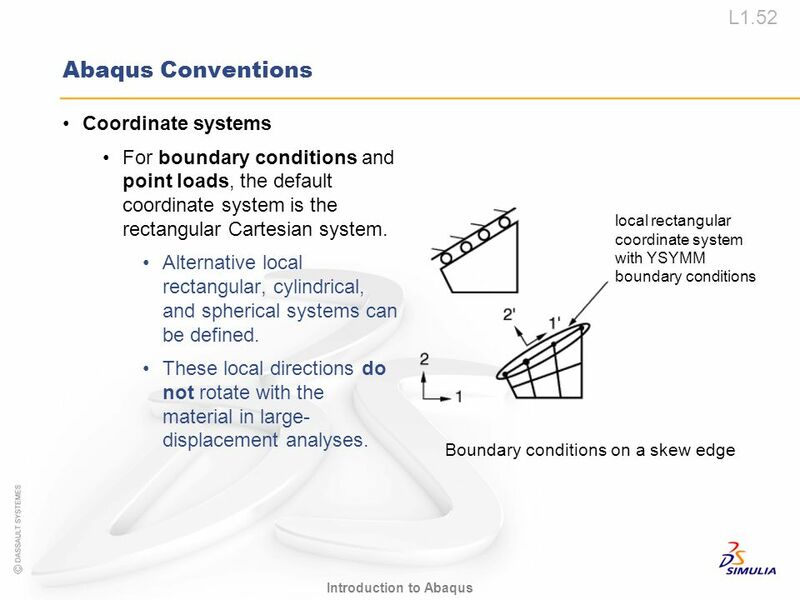 Aspects of the model can be regenerated. 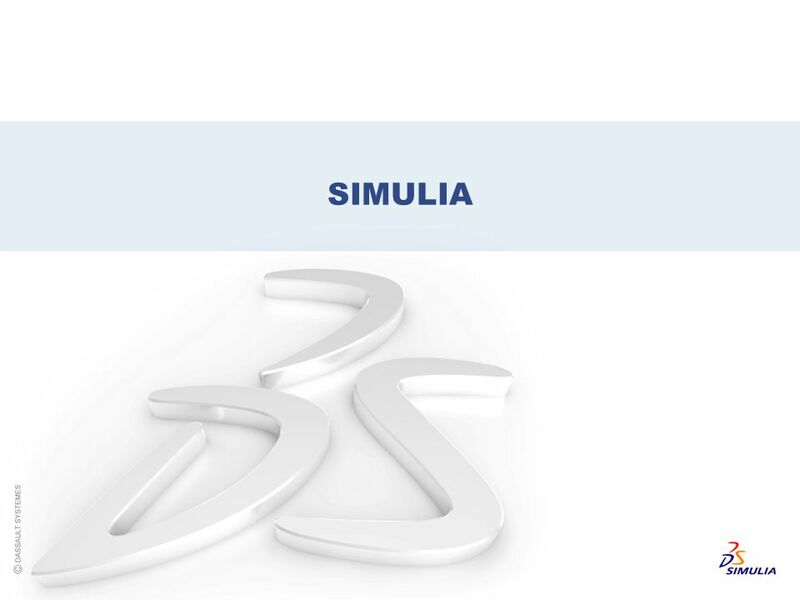 Parametric studies are easy and natural. Features can also be deleted or temporarily suppressed with the option to resume them later. 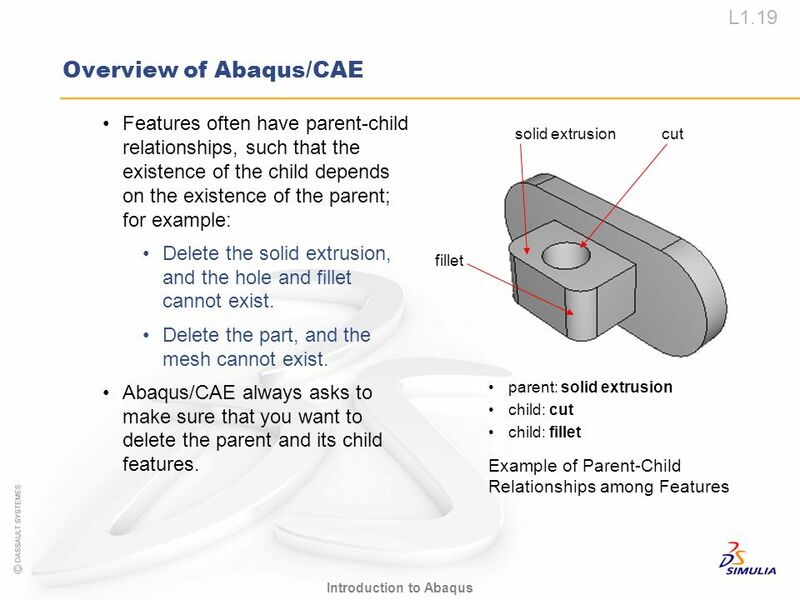 If a parent feature is deleted or suppressed, all its child features are also deleted or suppressed. 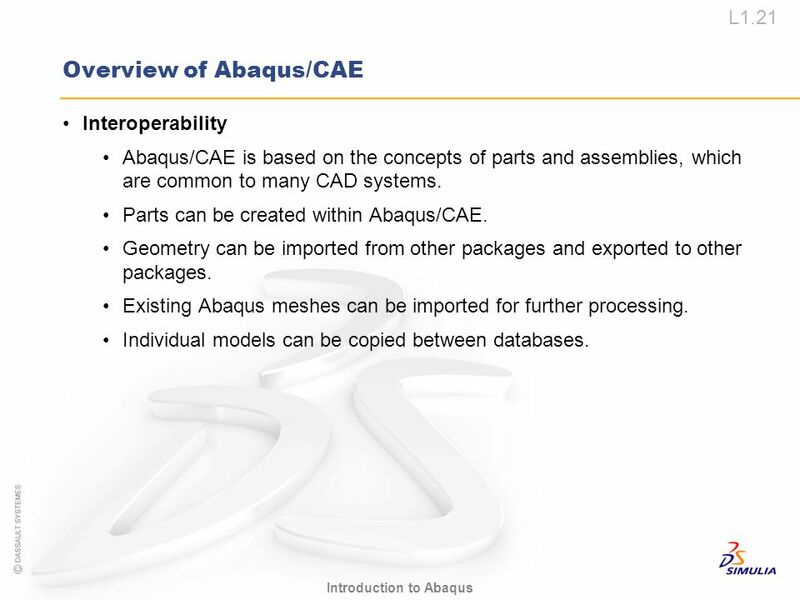 Interoperability Abaqus/CAE is based on the concepts of parts and assemblies, which are common to many CAD systems. 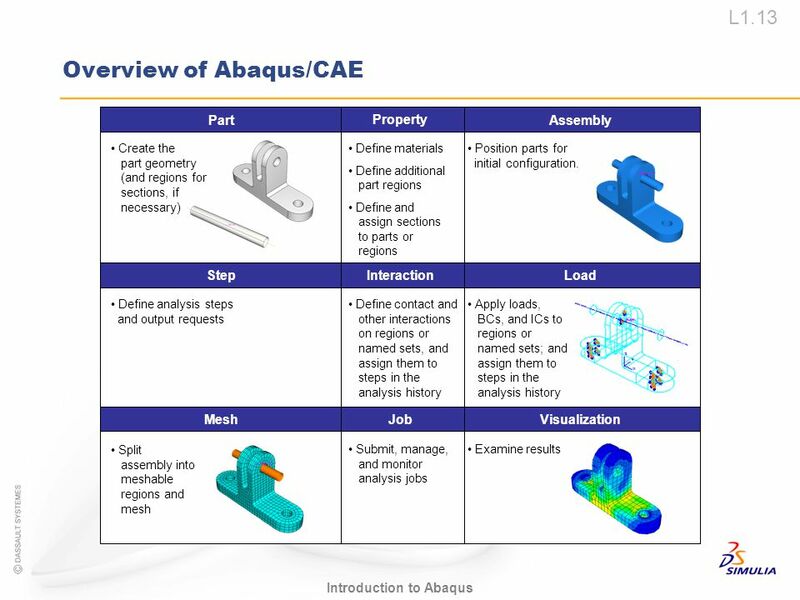 Parts can be created within Abaqus/CAE. Geometry can be imported from other packages and exported to other packages. 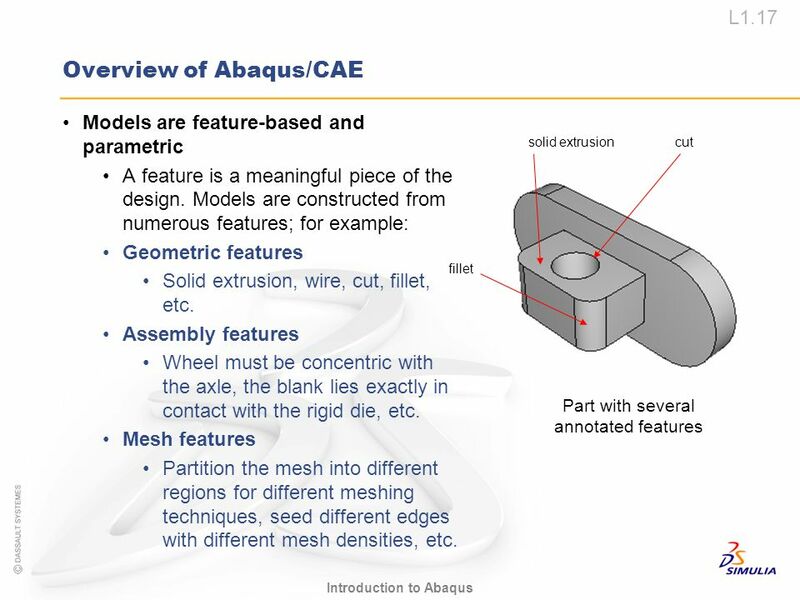 Existing Abaqus meshes can be imported for further processing. 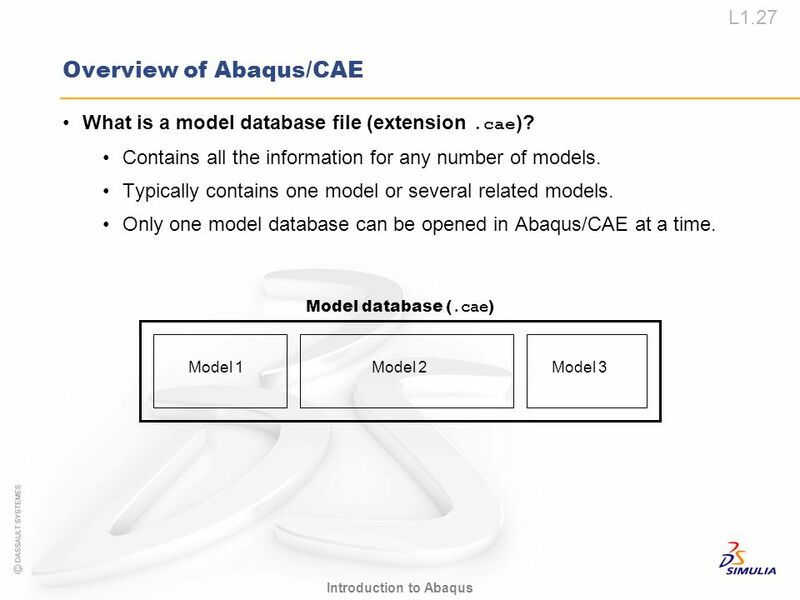 Individual models can be copied between databases. Custom keyboard shortcuts Available for most functions. 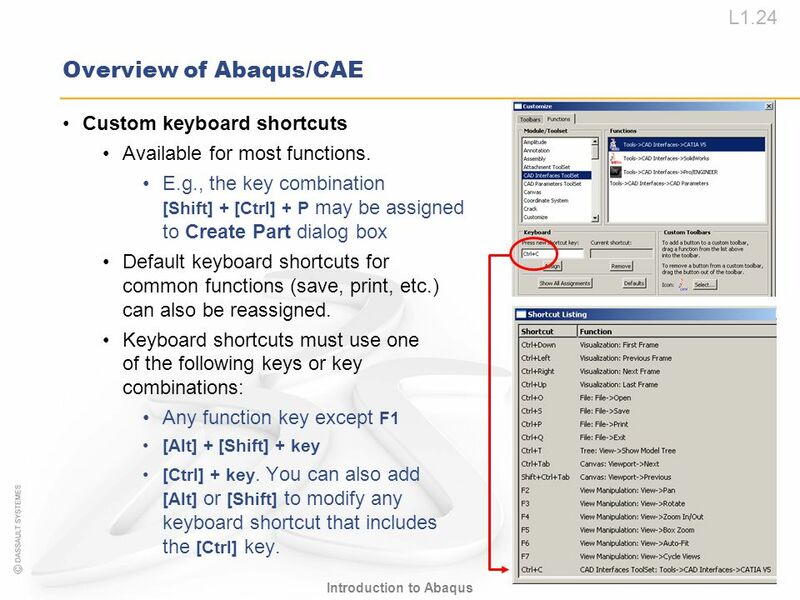 E.g., the key combination [Shift] + [Ctrl] + P may be assigned to Create Part dialog box Default keyboard shortcuts for common functions (save, print, etc.) can also be reassigned. Keyboard shortcuts must use one of the following keys or key combinations: Any function key except F1 [Alt] + [Shift] + key [Ctrl] + key. You can also add [Alt] or [Shift] to modify any keyboard shortcut that includes the [Ctrl] key. View manipulation Toolbar to control view (pan, zoom, rotate, etc.). Alternatively, can use a combination of keyboard and mouse actions: Rotate: [Ctrl]+[Alt]+MB1. Pan: [Ctrl]+[Alt]+MB2. Zoom: [Ctrl]+[Alt]+MB3. 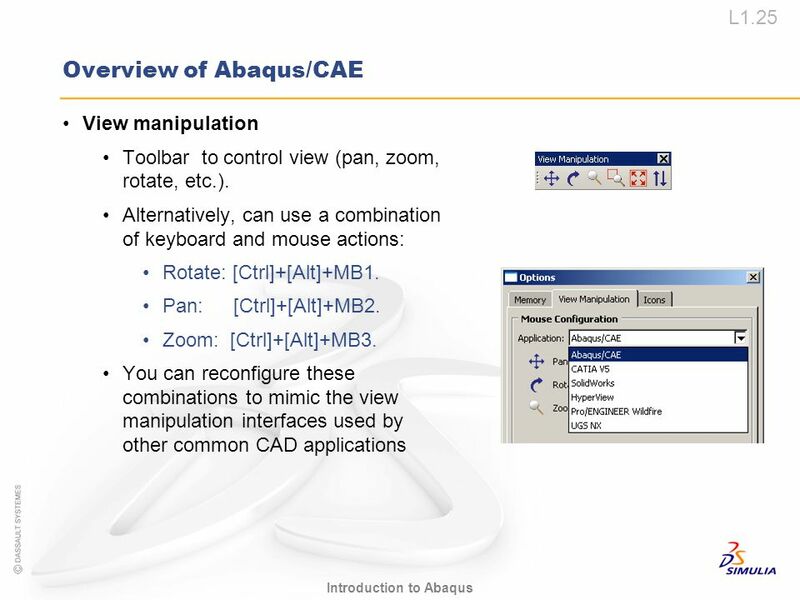 You can reconfigure these combinations to mimic the view manipulation interfaces used by other common CAD applications Note that there is a limitation with the use of the HyperView mouse configuration; specifically, with the HyperView setting it is not possible to deselect entities using [Ctrl ]+ [MB1] since this automatically invokes the rotation tool. If you have a student who uses HyperView, please warn them of this limitation. 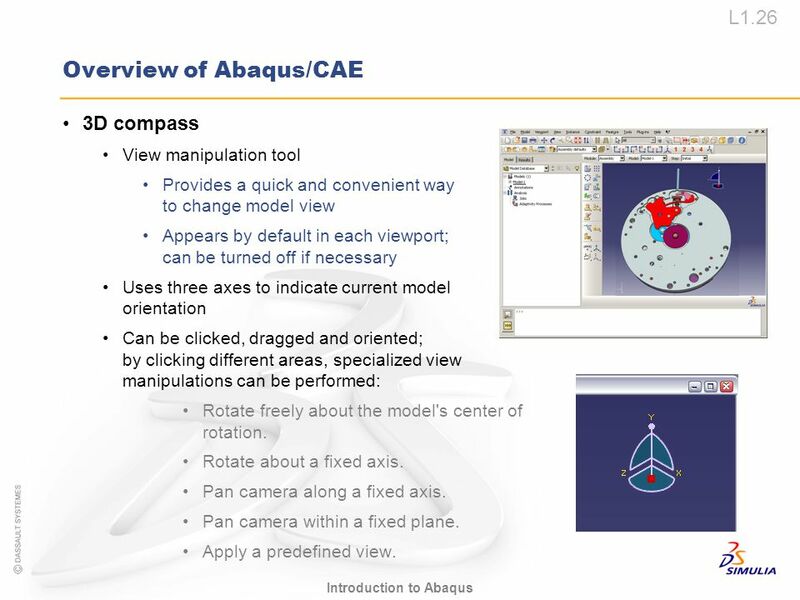 3D compass View manipulation tool Provides a quick and convenient way to change model view Appears by default in each viewport; can be turned off if necessary Uses three axes to indicate current model orientation Can be clicked, dragged and oriented; by clicking different areas, specialized view manipulations can be performed: Rotate freely about the model's center of rotation. Rotate about a fixed axis. Pan camera along a fixed axis. Pan camera within a fixed plane. Apply a predefined view. What is Python? 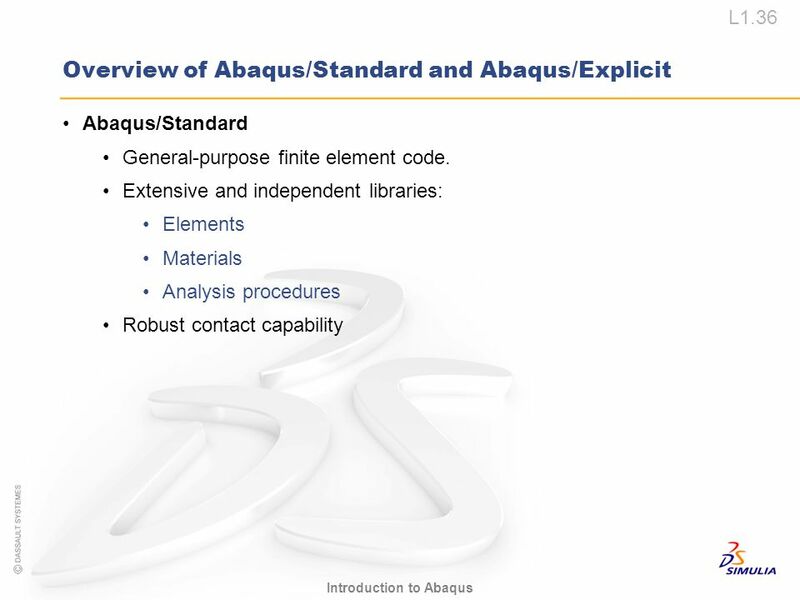 Command language used by Abaqus/CAE. 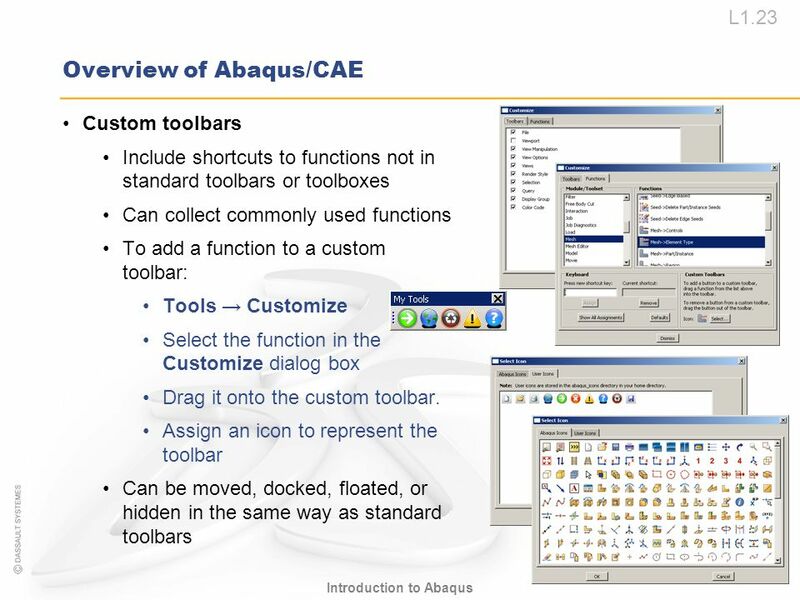 Uses range from command scripting to creating customized applications. Powerful and easy-to-use public domain, object-oriented programming language. 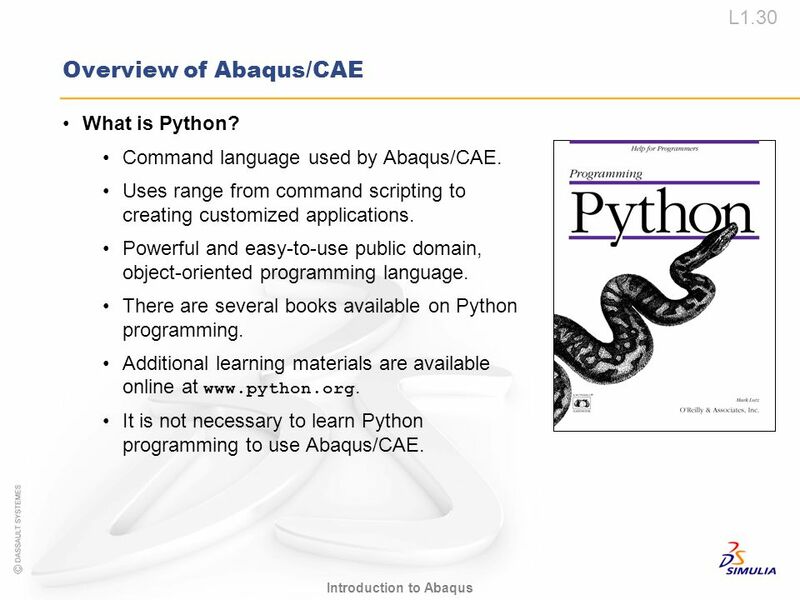 There are several books available on Python programming. Additional learning materials are available online at It is not necessary to learn Python programming to use Abaqus/CAE. 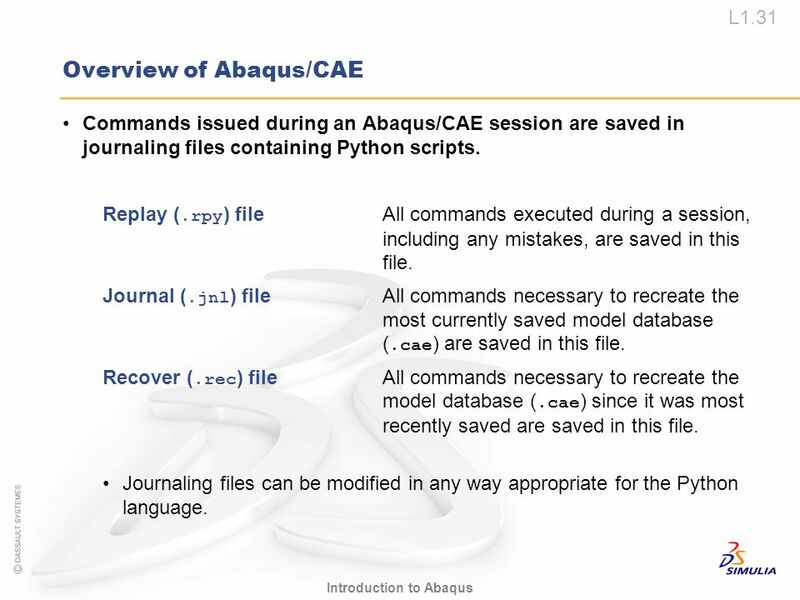 Commands issued during an Abaqus/CAE session are saved in journaling files containing Python scripts. Replay (.rpy) file All commands executed during a session, including any mistakes, are saved in this file. Journal (.jnl) file All commands necessary to recreate the most currently saved model database (.cae) are saved in this file. Recover (.rec) file	All commands necessary to recreate the model database (.cae) since it was most recently saved are saved in this file. Journaling files can be modified in any way appropriate for the Python language. 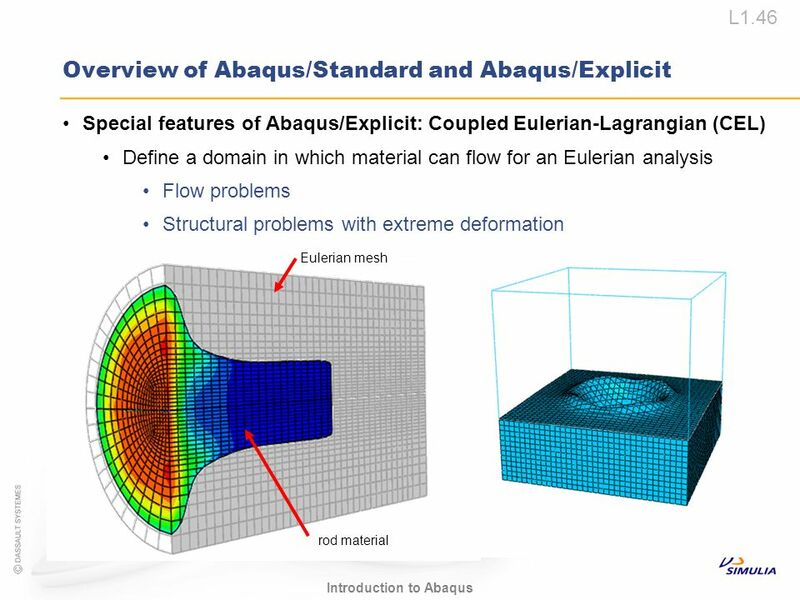 Special features of Abaqus/Explicit: Coupled Eulerian-Lagrangian (CEL) Define a domain in which material can flow for an Eulerian analysis Flow problems Structural problems with extreme deformation Eulerian mesh rod material Animated slide – click to show rod impact example and click again show the results at the final frame and “Mesh refinement needed …” text box. 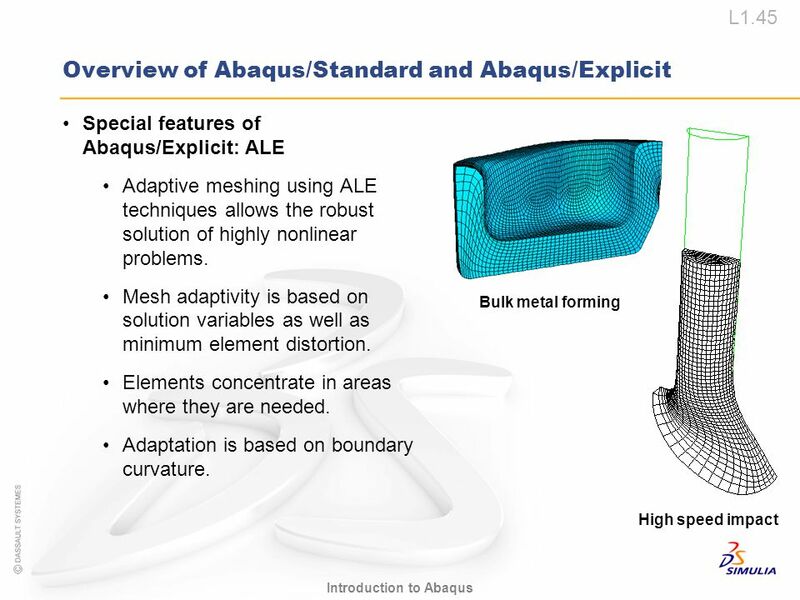 Abaqus/Explicit also provides elements that use a pure Eulerian formulation, in which the nodes stay fixed and the material flows through the mesh. 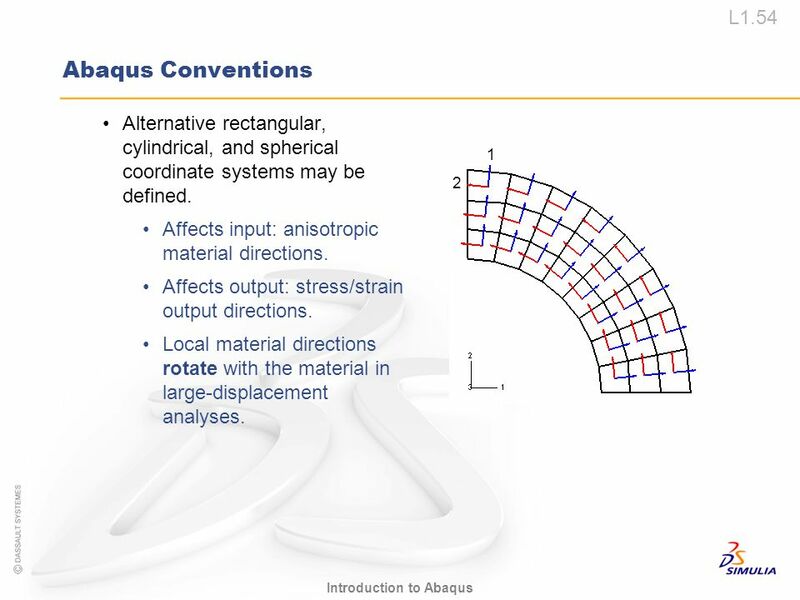 Although the Eulerian formulation does make it more difficult to track material boundaries, it has the advantage of completely eliminating mesh distortion due to material deformation. 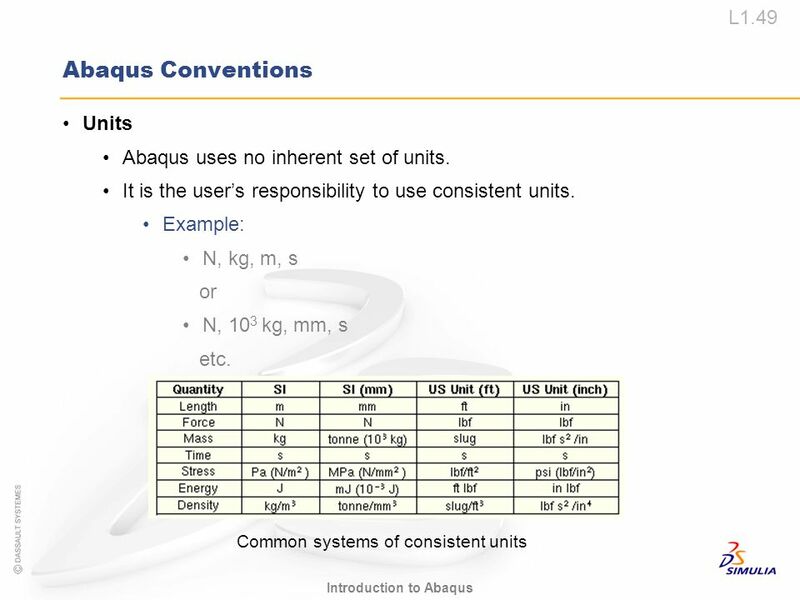 49 Abaqus Conventions Units Abaqus uses no inherent set of units. 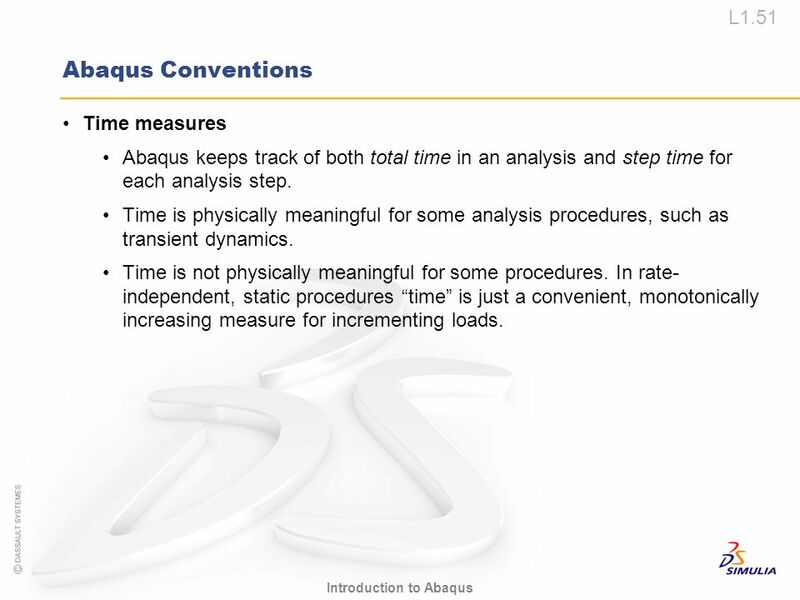 Abaqus keeps track of both total time in an analysis and step time for each analysis step. 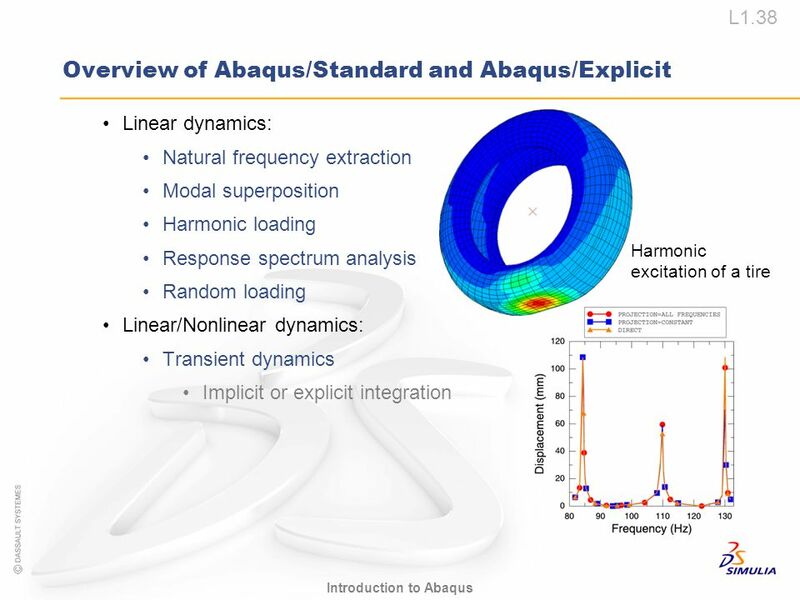 Time is physically meaningful for some analysis procedures, such as transient dynamics. Time is not physically meaningful for some procedures. In rate-independent, static procedures “time” is just a convenient, monotonically increasing measure for incrementing loads. Primary solution variables at the nodes. 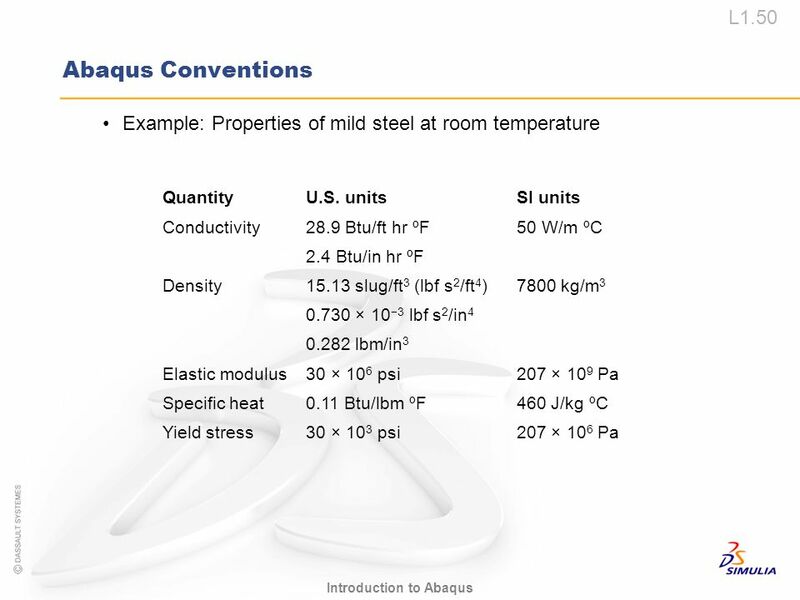 Available nodal degrees of freedom depend on the element type. 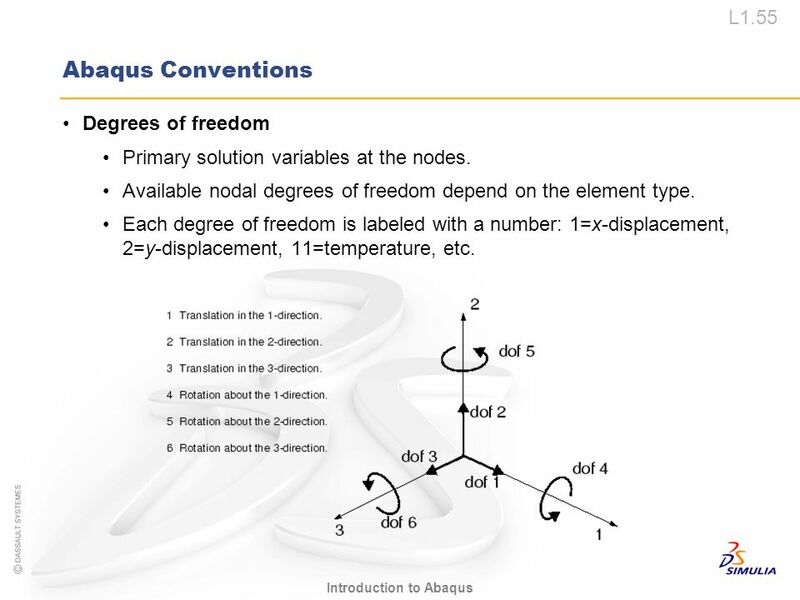 Each degree of freedom is labeled with a number: 1=x-displacement, 2=y-displacement, 11=temperature, etc. 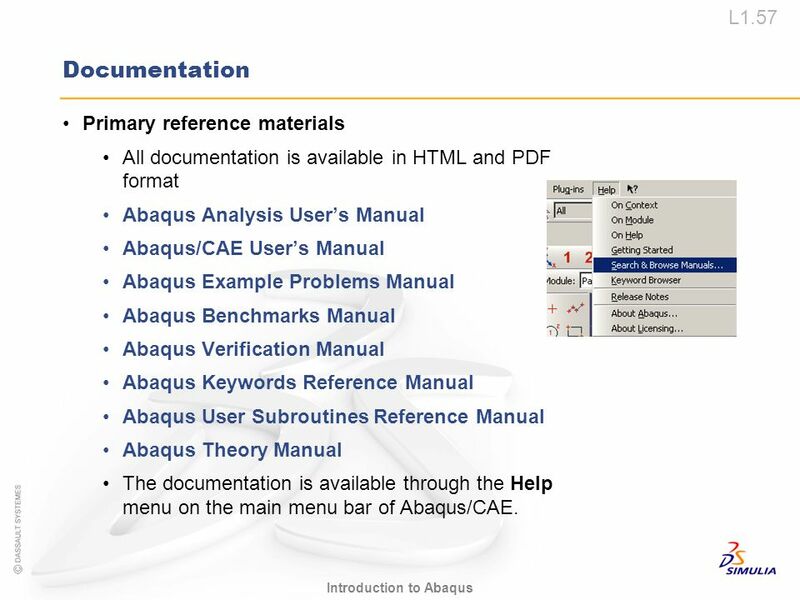 All documentation is available in HTML and PDF format Abaqus Analysis User’s Manual Abaqus/CAE User’s Manual Abaqus Example Problems Manual Abaqus Benchmarks Manual Abaqus Verification Manual Abaqus Keywords Reference Manual Abaqus User Subroutines Reference Manual Abaqus Theory Manual The documentation is available through the Help menu on the main menu bar of Abaqus/CAE. 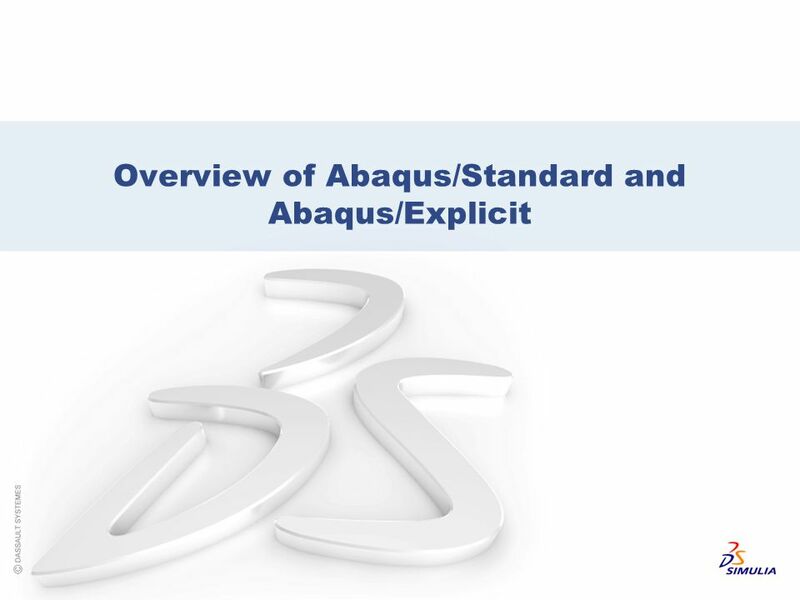 The Abaqus environment settings allow you to control various aspects of an Abaqus job’s execution. 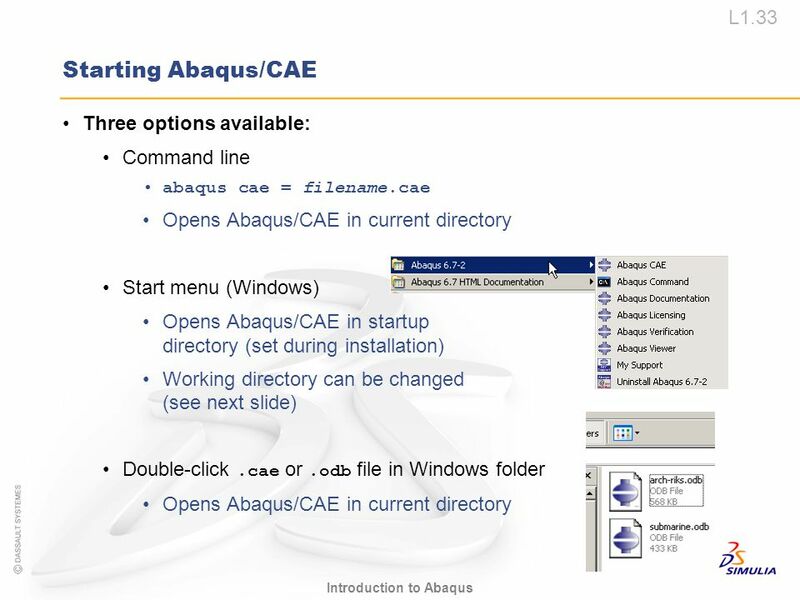 For example, setting a directory to be used for scratch files, changing the default memory settings, etc. 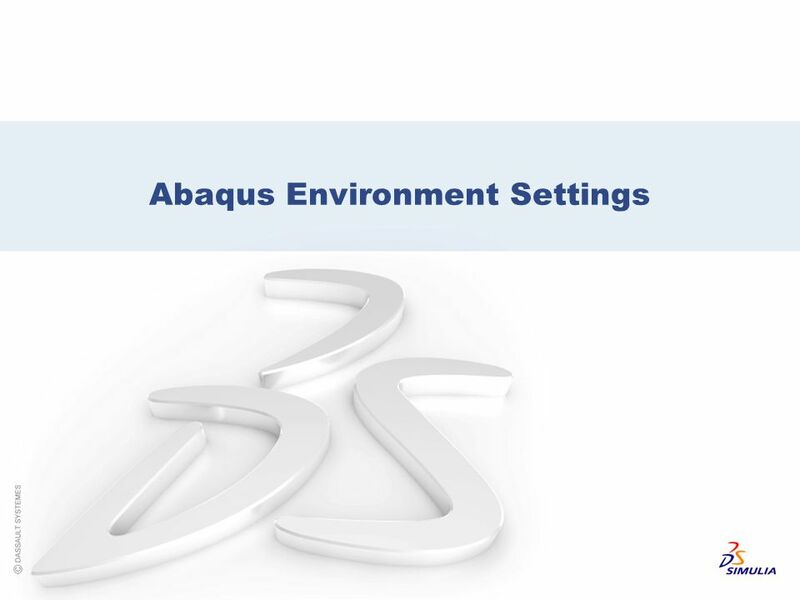 Environment settings hierarchy Abaqus environment settings are processed in the following order: The host-level environment settings in the site directory in the abaqus account directory. 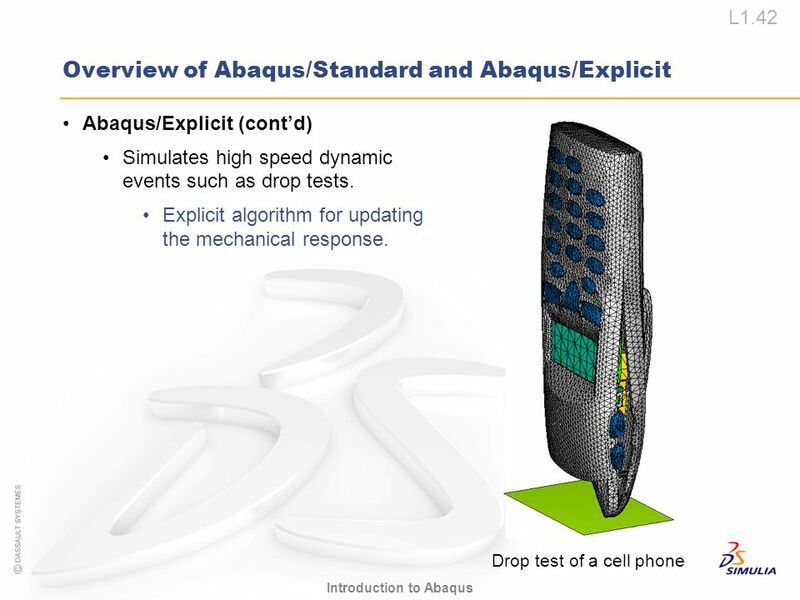 These settings are applied to all Abaqus jobs run on the designated computer. 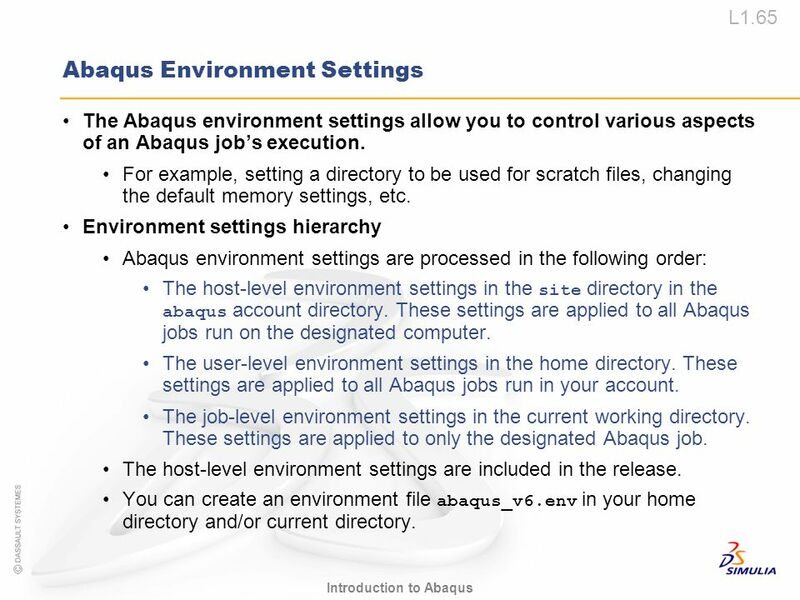 The user-level environment settings in the home directory. 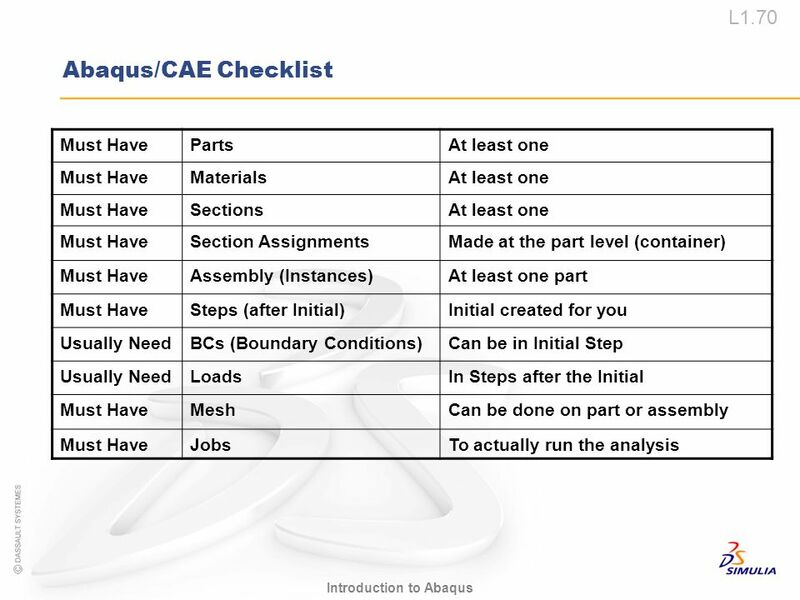 These settings are applied to all Abaqus jobs run in your account. 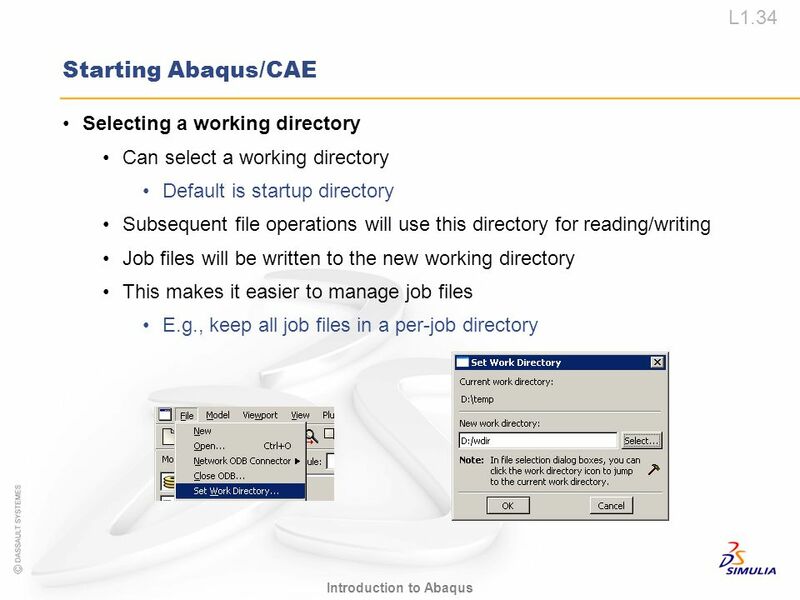 The job-level environment settings in the current working directory. 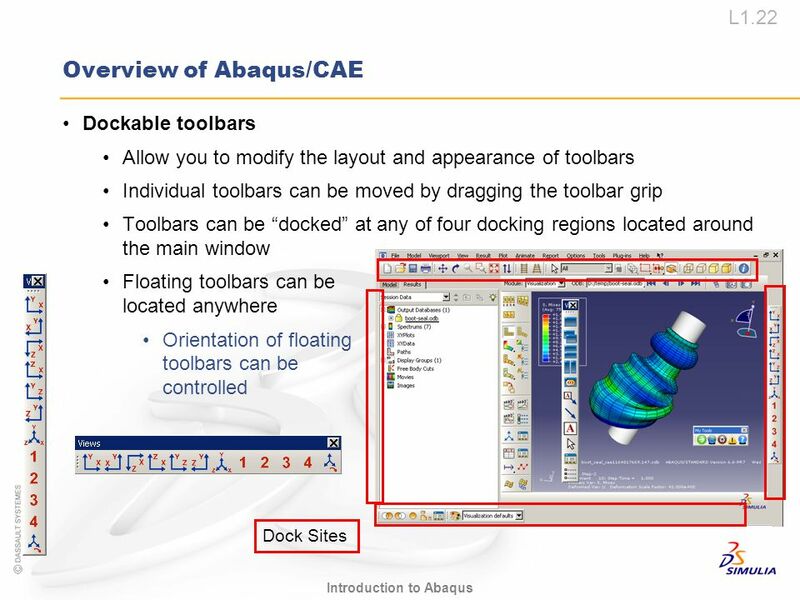 These settings are applied to only the designated Abaqus job. The host-level environment settings are included in the release. You can create an environment file abaqus_v6.env in your home directory and/or current directory. Note: The value of the SCRATCH parameter is platform specific. On UNIX platforms the default value is the value of the $TMPDIR environment variable or /tmp if this variable is not defined. 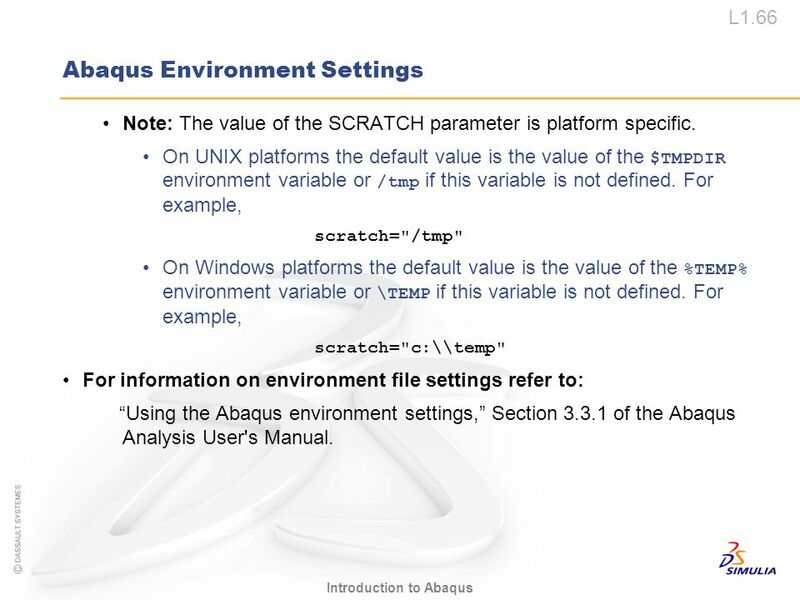 For example, scratch="/tmp" On Windows platforms the default value is the value of the %TEMP% environment variable or \TEMP if this variable is not defined. For example, scratch="c:\\temp" For information on environment file settings refer to: “Using the Abaqus environment settings,” Section 3.3.1 of the Abaqus Analysis User's Manual. 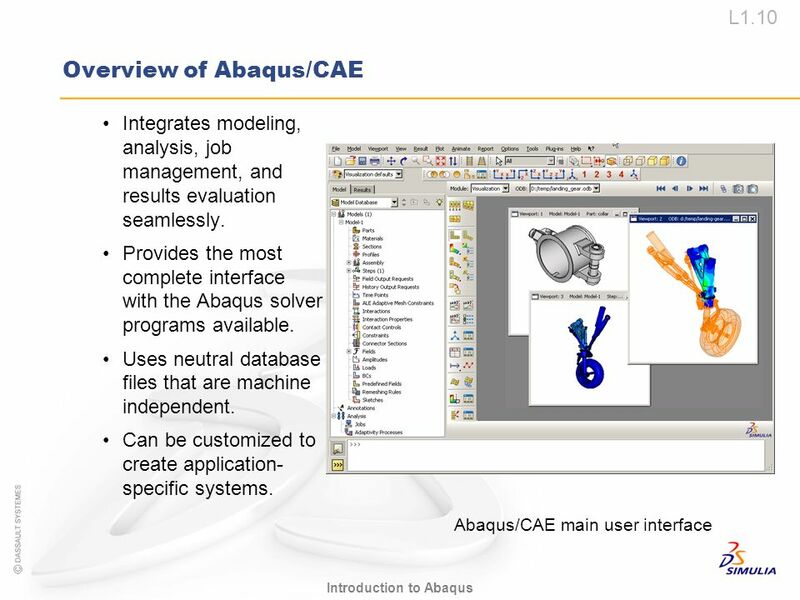 68 Abaqus Fetch Utility The Abaqus fetch utility allows you to extract sample Abaqus files that are provided with each release. 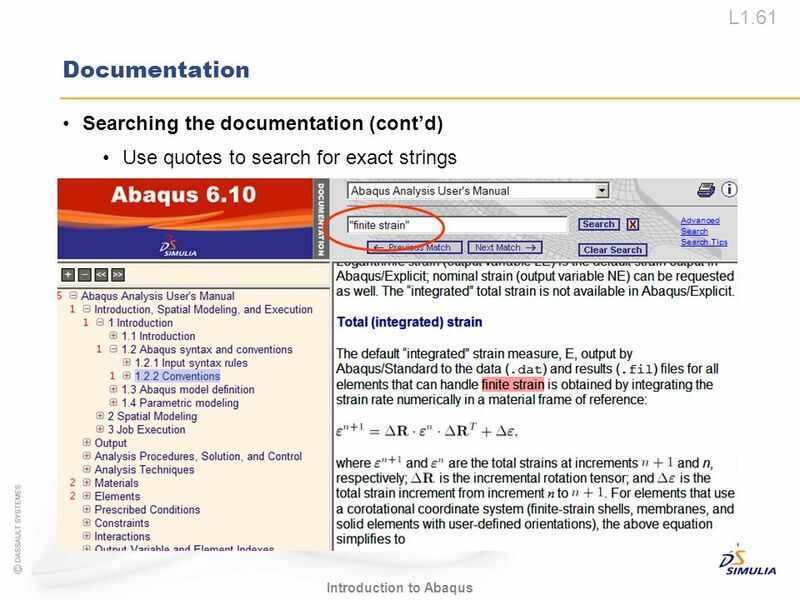 Files that may be extracted include input files, journal files, model databases, etc. 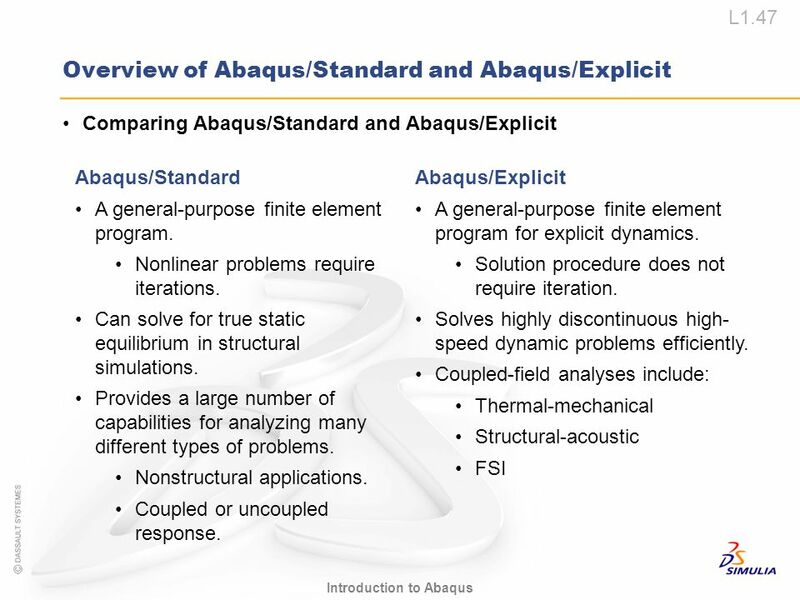 corresponding to the Abaqus Example, Benchmark, and Verification problems. 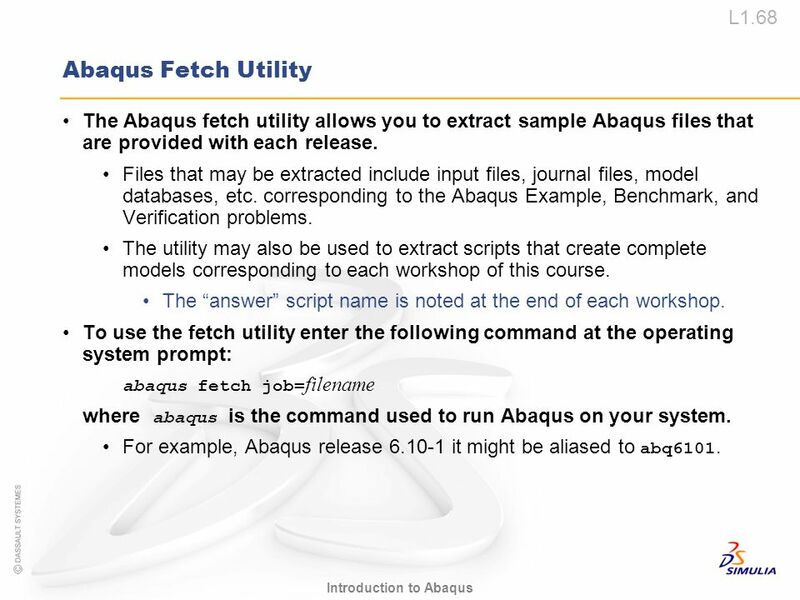 The utility may also be used to extract scripts that create complete models corresponding to each workshop of this course. 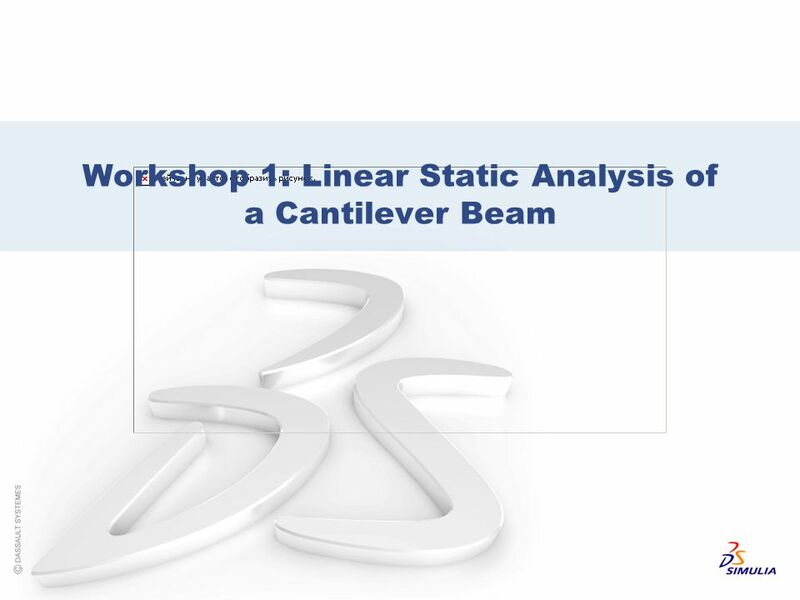 The “answer” script name is noted at the end of each workshop. To use the fetch utility enter the following command at the operating system prompt: abaqus fetch job=filename where abaqus is the command used to run Abaqus on your system. 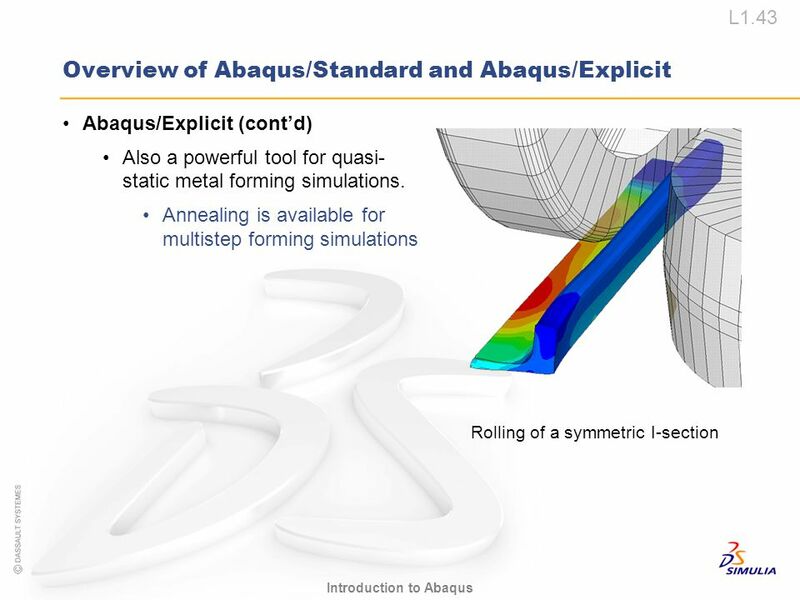 For example, Abaqus release it might be aliased to abq6101. 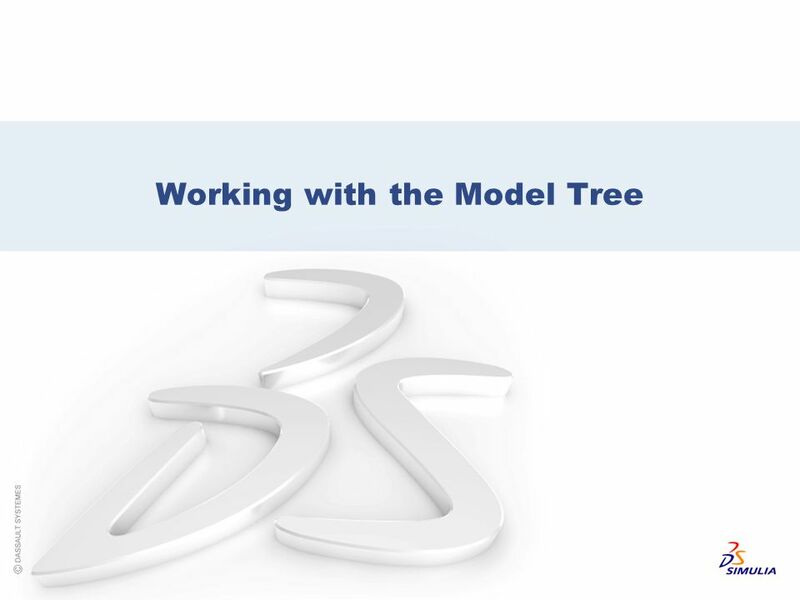 The Model Tree is a convenient tool for navigating and managing your models and analysis results. 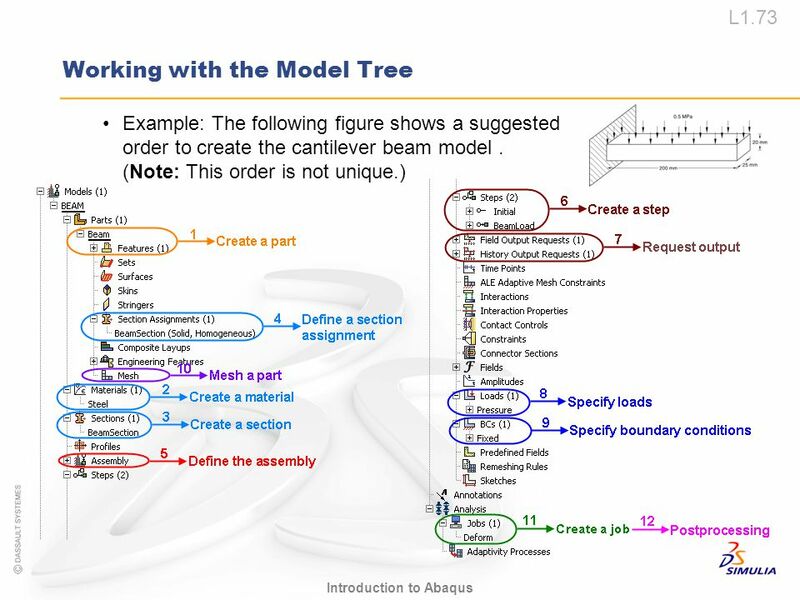 The Model Tree provides a visual description of the hierarchy of items in a model. 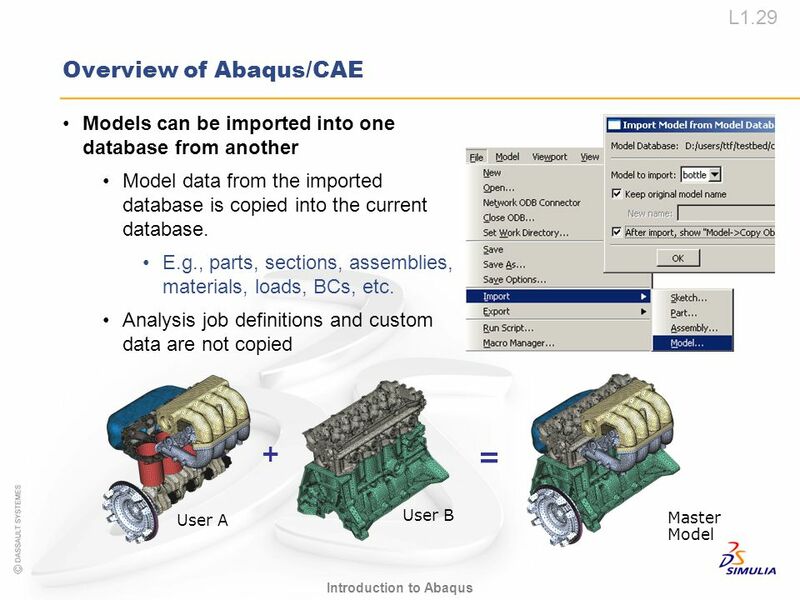 The arrangement of the containers and items in the Model Tree reflects the order in which you are likely to create your model. 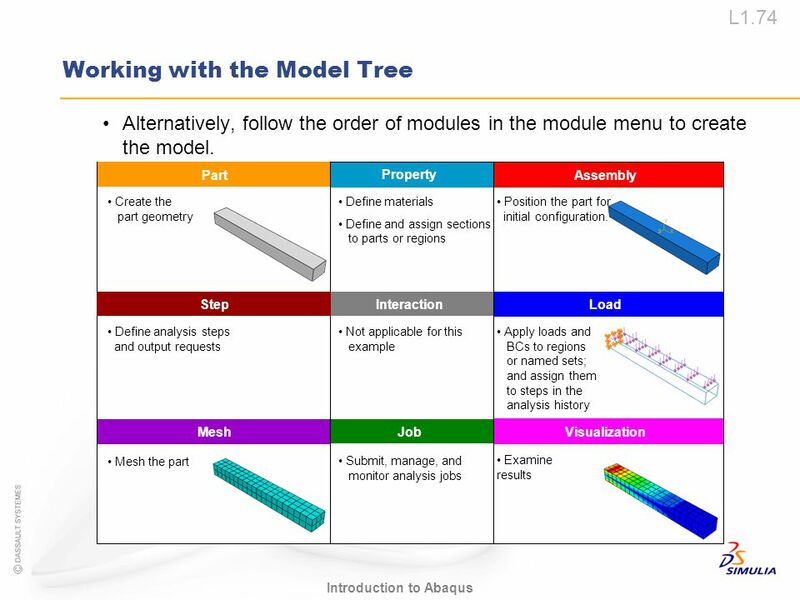 A similar logic governs the order of modules in the module menu—you create parts before you create the assembly, and you create steps before you create loads. 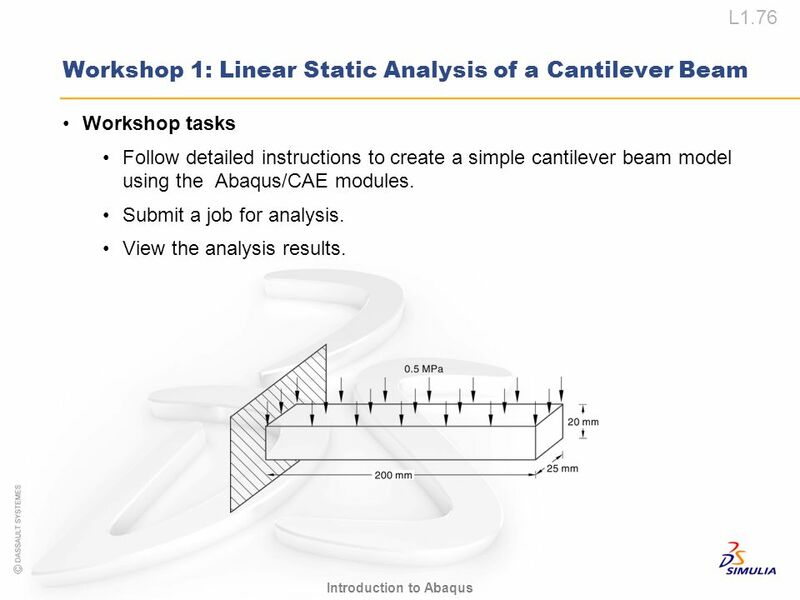 Workshop tasks Follow detailed instructions to create a simple cantilever beam model using the Abaqus/CAE modules. 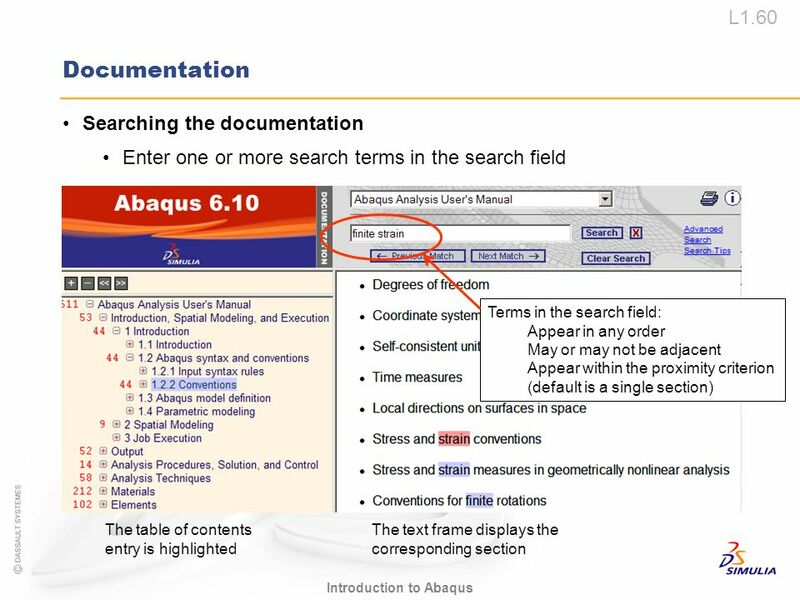 Submit a job for analysis. 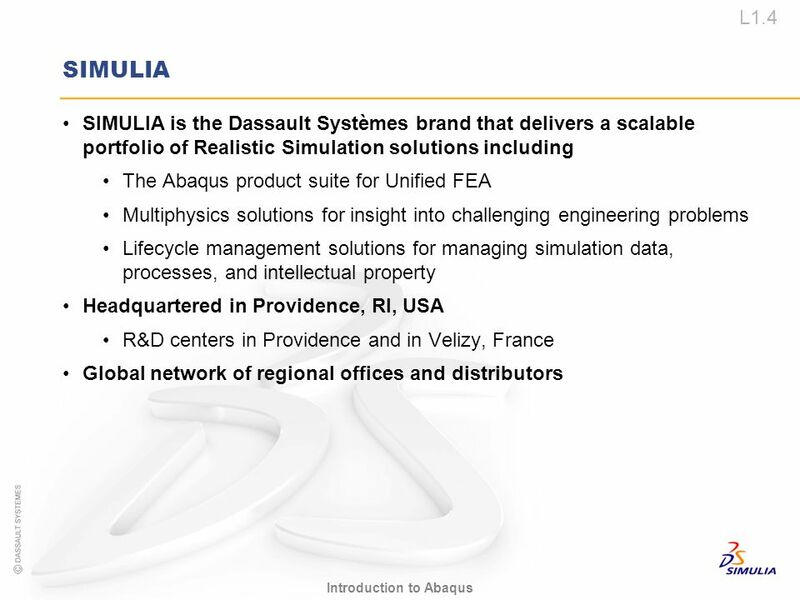 View the analysis results. 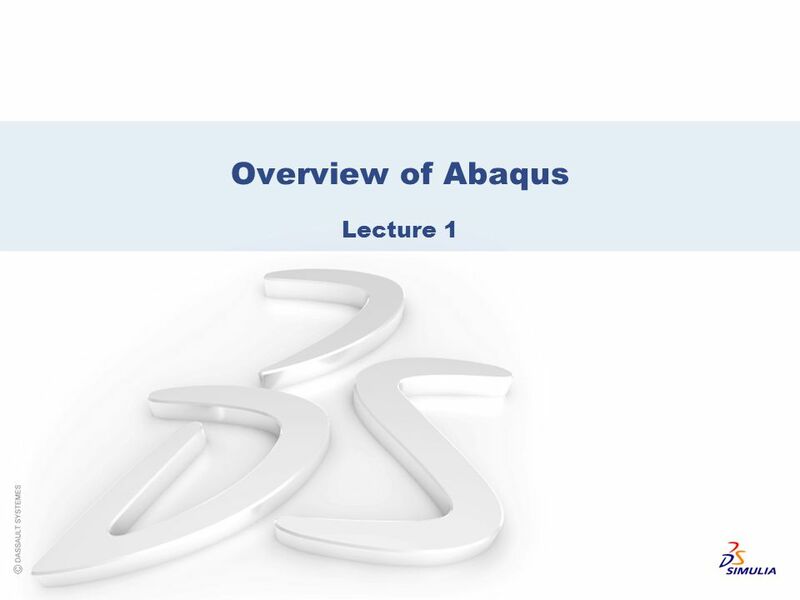 Download ppt "Overview of Abaqus Lecture 1." 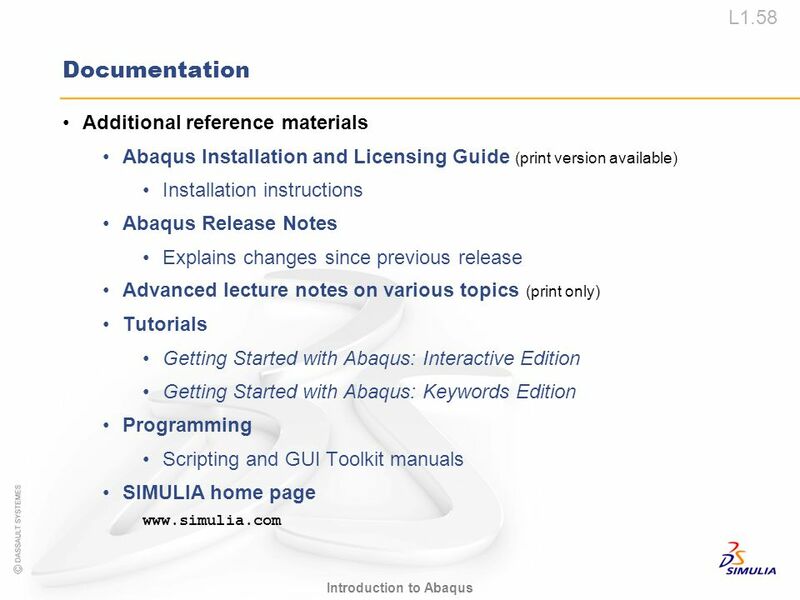 CS0004: Introduction to Programming Visual Studio 2010 and Controls. 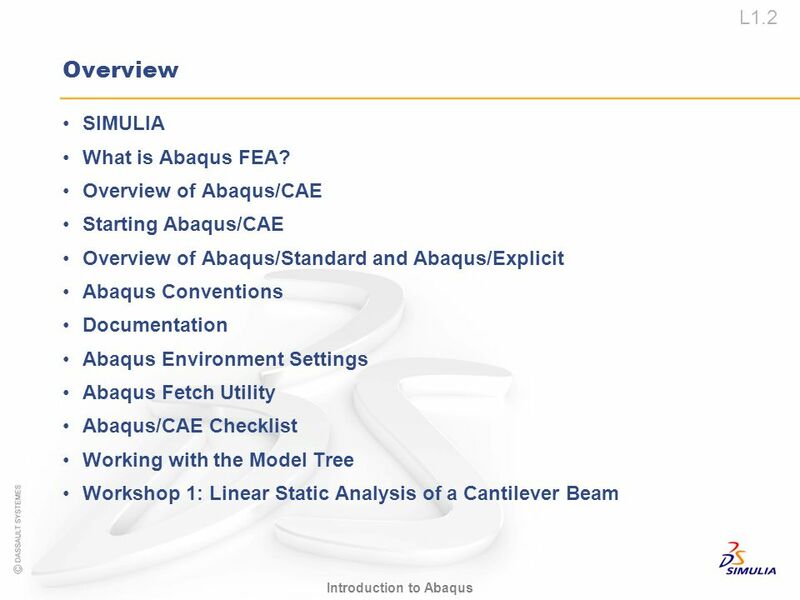 Introduction to ABAQUS 27 th February, Units Before starting to define any model, you need to decide which system of units you will use. 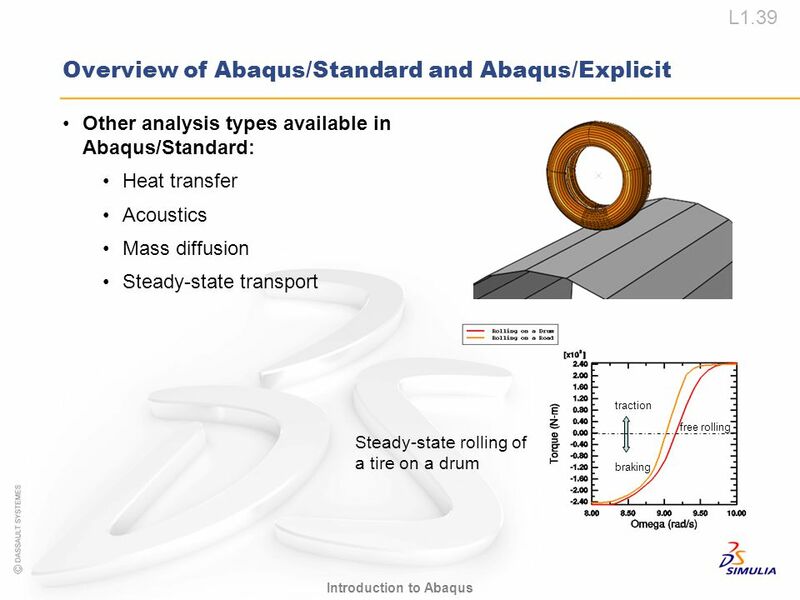 ABAQUS. 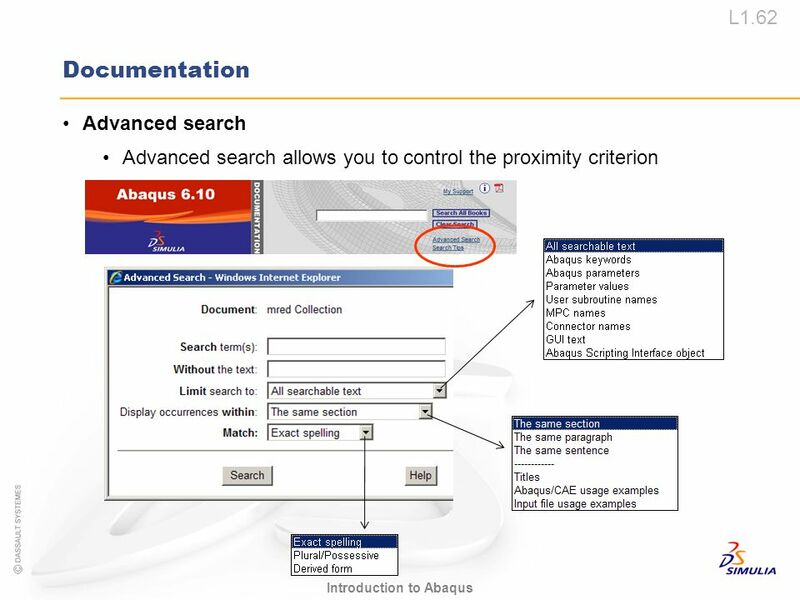 XP 1 Using Common Features of Microsoft Office 2003 Rod Rodrigues. Chapter 2: The Visual Studio.NET Development Environment Visual Basic.NET Programming: From Problem Analysis to Program Design. 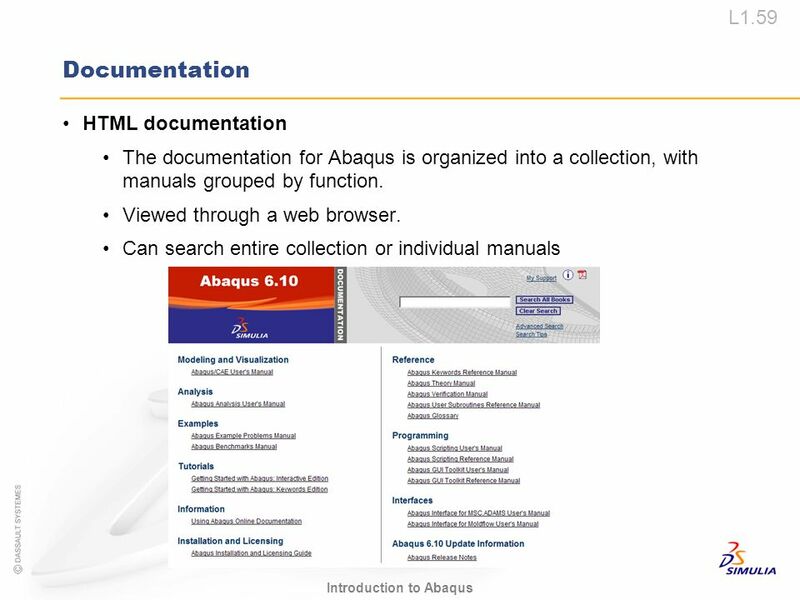 XP Using Common Features of Microsoft Office Tutorial 1. 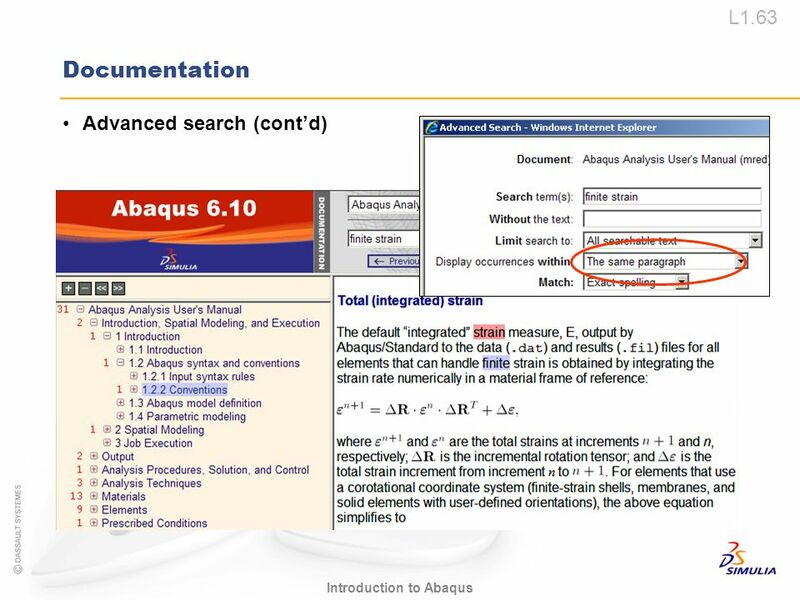 Management Information Systems MS Access 2003 By: Mr. Imdadullah Lecturer, Department of M.I.S. College of Business Administration, KSU. Lesson 1 Introduction.  Workbook- Use it like one (You are not going to sell this book back)  Use Questions and Exercises at end of each chapter to. Introduction to virtual engineering László Horváth Budapest Tech John von Neumann Faculty of Informatics Institute of Intelligent Engineering. 2. Introduction to the Visual Studio.NET IDE 2. Introduction to the Visual Studio.NET IDE Ch2 – Deitel’s Book.